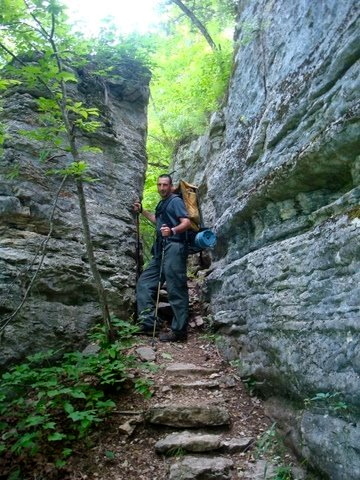 I will be updating live throughout the day as we hike a 15-mile section of the Knobstone Trail in southern Indiana. 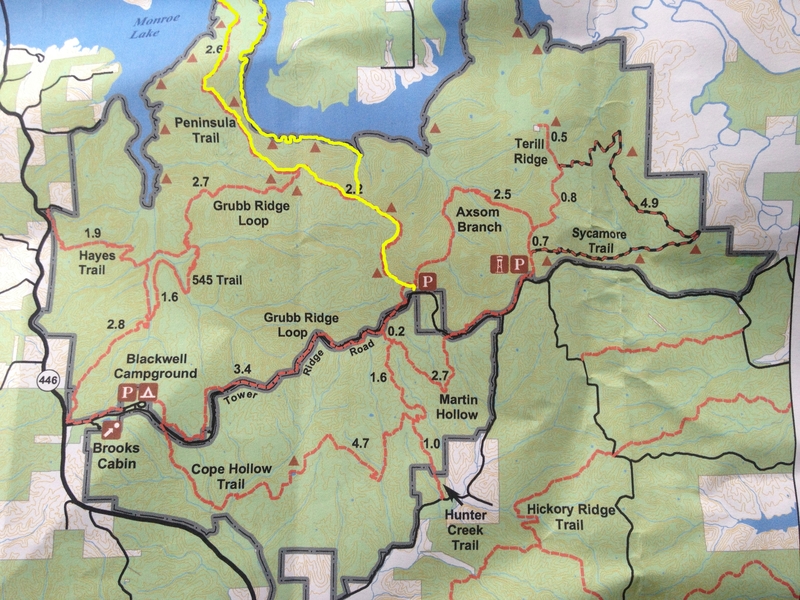 The entire Knobstone Trail is about 40 miles. 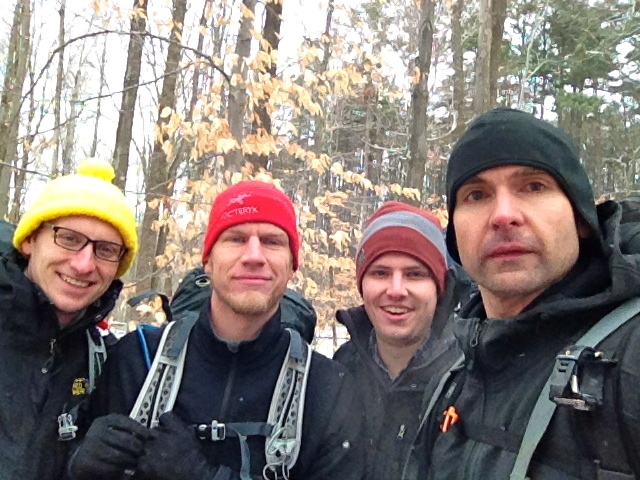 Two weekends ago, a couple of the guys went out to tackle the entire trail. It was an ambitious goal for a few reasons. Of course it was very cold and snowing, which made the conditions quite muddy, but there was an even greater obstacle: elevation. I know that sounds crazy because Indiana is vertically challenged. But, I am dead serious. Over the 40 mile hike the total elevation gain is 10,500 feet. I know, I know that is insane! That is as much elevation gain as we did in July in the Rocky Mountains. 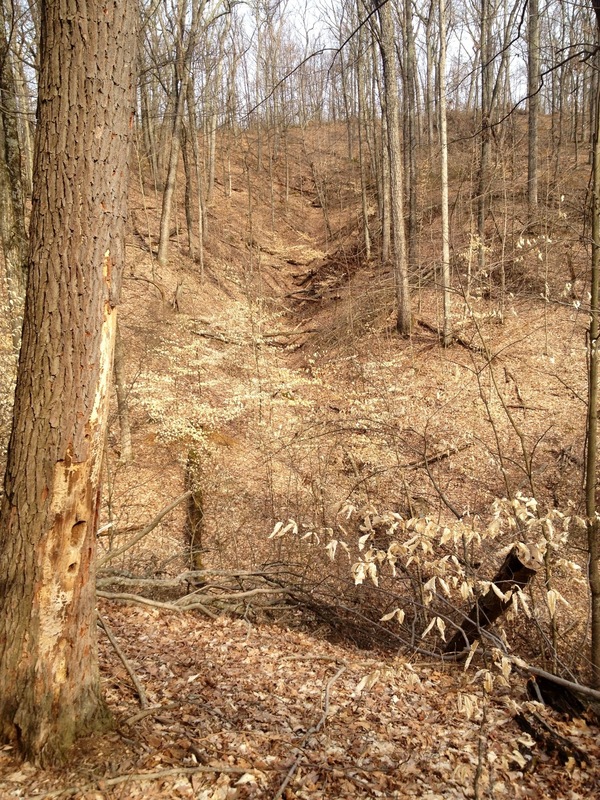 But that just proves how hilly this portion of trail is in southern Indiana. 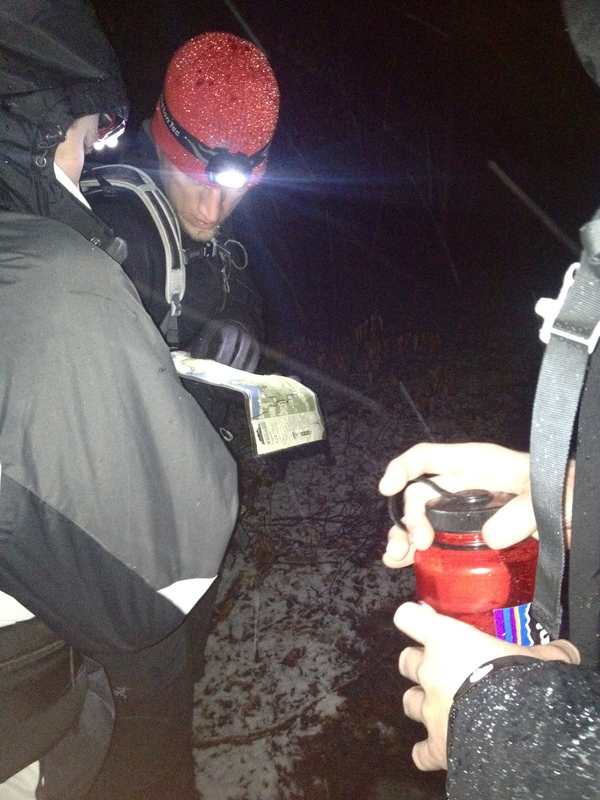 The guys covered approximately 25 miles before calling it quits because of the conditions. I am joining them today to finish the final 15 miles. 8:15 AM- From I-65 we dropped off one car at Delaney Park. It was about 10 miles off of I-65 and took about 30 minutes to get to the park. What a beautiful drive. The sun was rising over the hills. We left Columbus with Thunderstorms and 41 degrees. Looking at clear skies now and already 56 degrees. 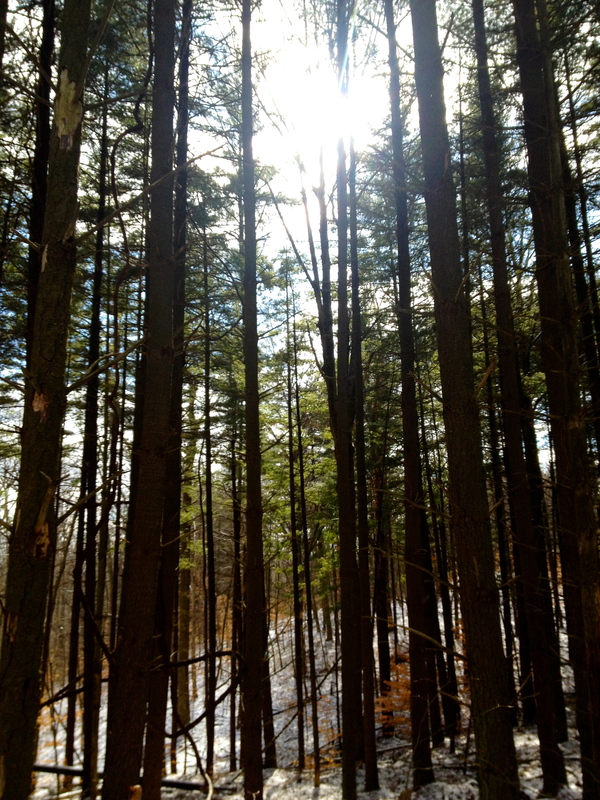 Fantastic day for a hike! 9:00 AM- Starting at Elk Creek. Beautiful, beautiful morning. First 15 minutes greeted us with a nice 200 ascent. Stopped to zip off the legs. Already 60 degrees. 9:40 AM- Nice breeze. Rewarding hike. 10:05 AM- This is NOT a trail for beginners or for families or anyone out of shape. The ascents and descents are rigorous. Definitely pushing me early. 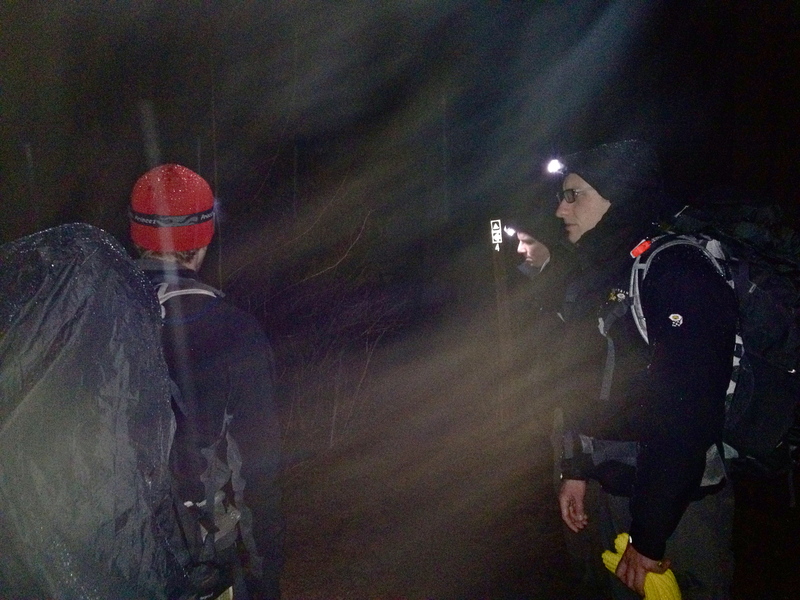 11:40 PM- The reason the early ascents and descents were so rough was because there are no switchbacks anywhere. 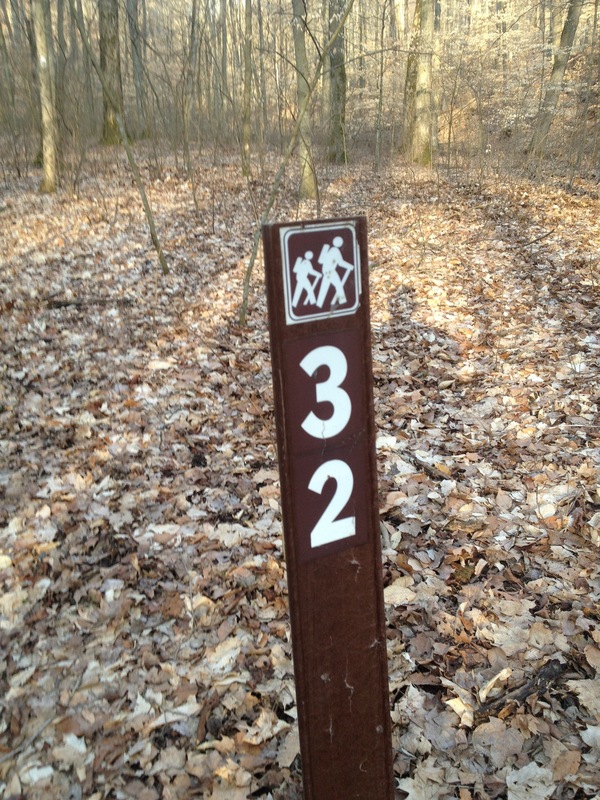 It is point A to point B. I am going to refer to this trail as The Good Ole Boy trail. Pretty trail though. Not any green yet. Still too early. Looks like Fall. On a trail deviation right now due to the tornado last year. Probably at the six or seven mile mark. Well the deviation only took us to mile 38 (which is only 5 miles). A lot of deviation walking with little return! 1:23 PM- Right before mile marker 40 Patrick said that other than the first three ascents.. this trail is pretty good. After marker 40… we hit the toughest ascent. Woof. We have about five miles remaining. 3:01 PM- Getting close to the end. I will write a summary when I get home. BUT just after mile marker 43 we hit the beast. It went STRAIGHT up and definitely was a hard way to end. 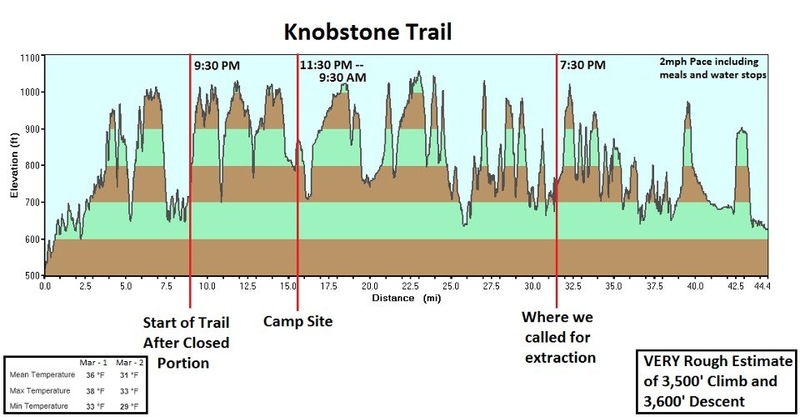 As you can see from the elevation chart above, the Knobstone Trail has many peaks and valleys, which make the overall elevation gain over 45 miles significant. For this particular trip we started at the third red line around the 32 mile marker and finished at around the 46 mile marker. We started around 9 AM with the temperature right at 60 degrees. Quickly into the hike we each had to loose some clothing. We had a constant 20 mph breeze that accompanied us over the 15 miles. The greatest challenge was the lack of switchbacks and you should make a note of this. Hiking a straight shot up a hill (and going down) at a 65 degree angle will test your stamina and your knees and ankles. The greatest head-scratcher was around the 37/38 mile marker. We descended over 150 feet straight down, turned to our left, and then the trail went back up to the ridge from which we had just descended. As soon as we got back to the top, the trail went immediately back down. It was incredibly frustrating and redundant. We could not understand why they did that. We thought we were on a hidden camera show. 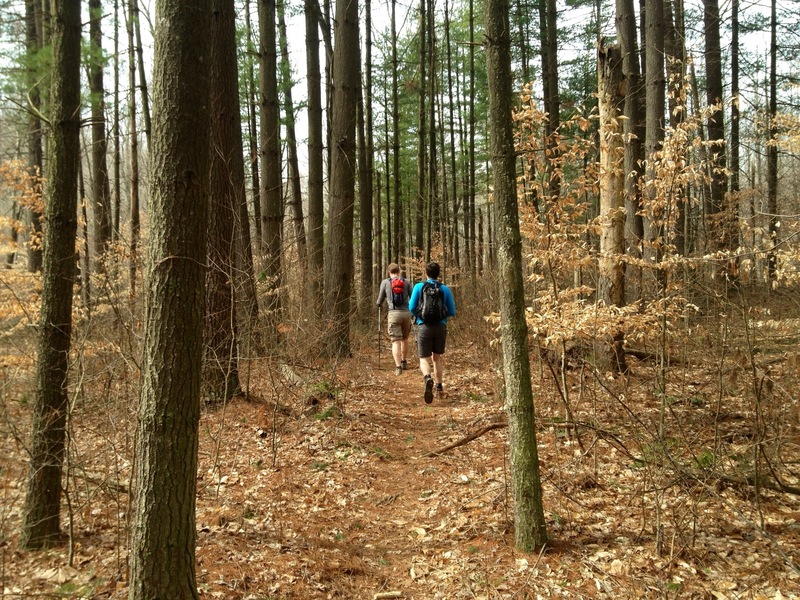 Ultimately, this portion of the Knobstone Trail is quite enjoyable and worth the effort. 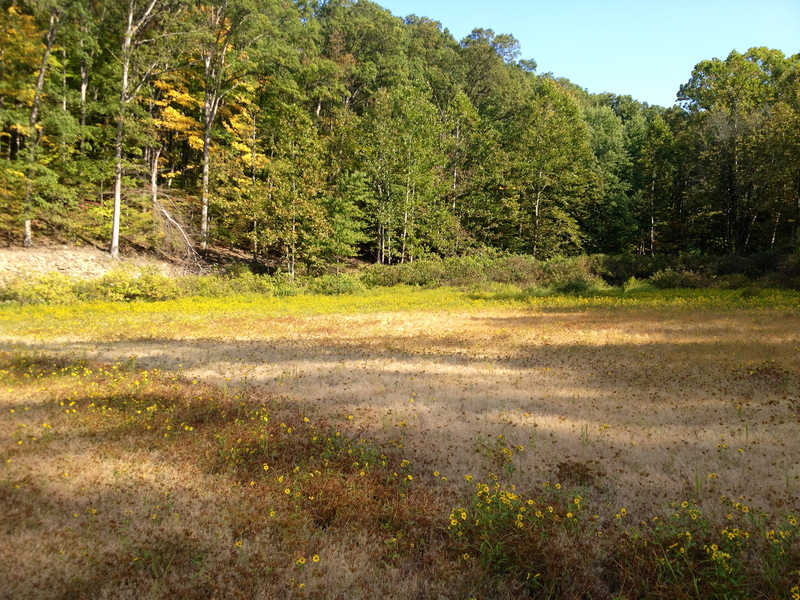 There were several areas where it leveled out and afforded some leisurely hiking. I wish the area would have been greener but it was still early. A few more views of the rolling hills would have been nice, but I really enjoyed my time there. 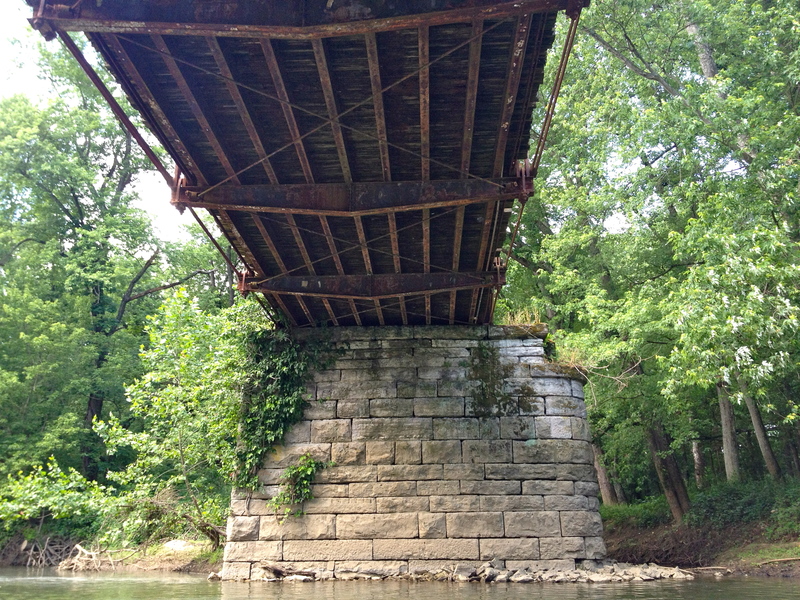 This is definitely a unique area in Southern Indiana to get opportunities for significant elevation. 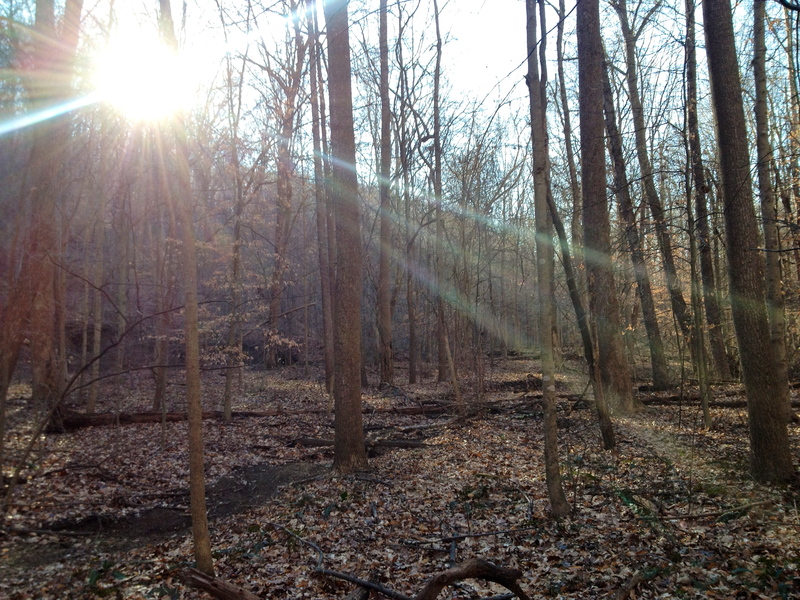 I can see why so many use this as a training ground for the Appalachian Trail (AT). 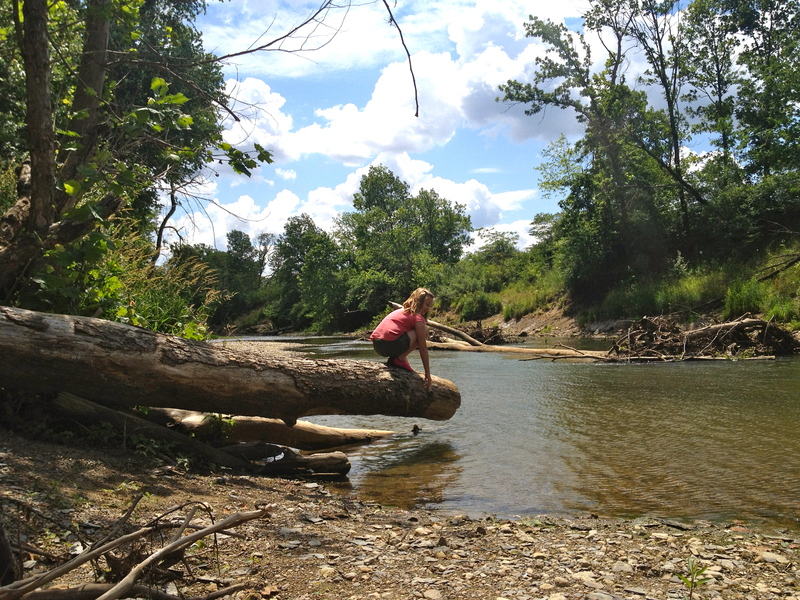 The weather forecast for this weekend looked to be incredible so I suggested that our family (minus Will this time) canoe a 7-mile stretch of the Driftwood River just north of Columbus, Indiana. 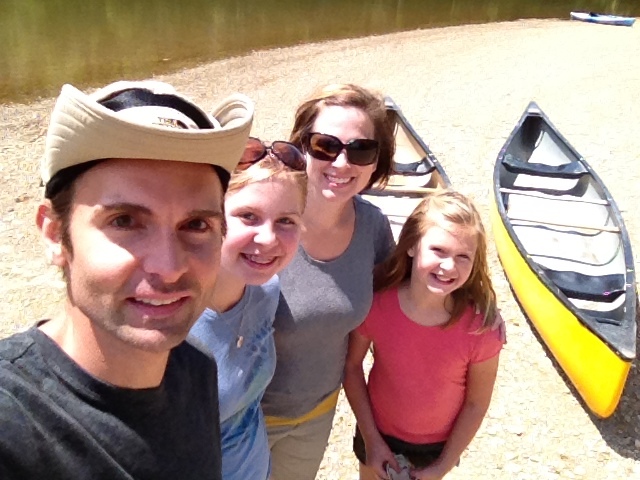 This was our first canoeing trip as a family…and the first time canoeing for Jenny, Anna, and Caroline. I was curious to see how they would do but I also knew that this section of the Driftwood River would be easy on beginners without many obstacles. 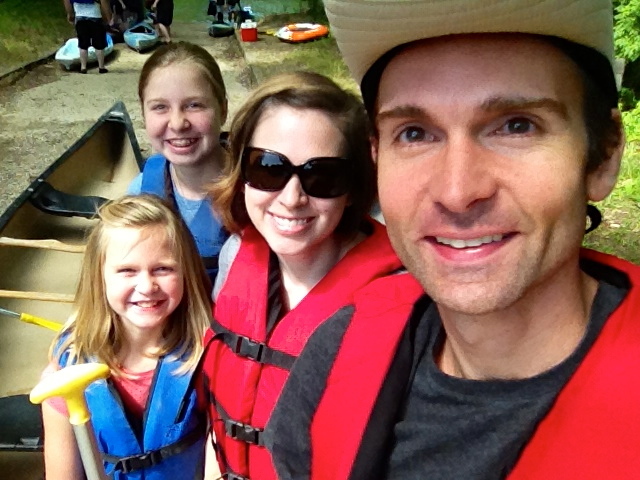 We rented our canoes from Blue’s Canoes Livery and they were incredibly easy to work with. They soon shuttled us just north of Taylorsville and we would launch from the Atterbury Boat Ramp. 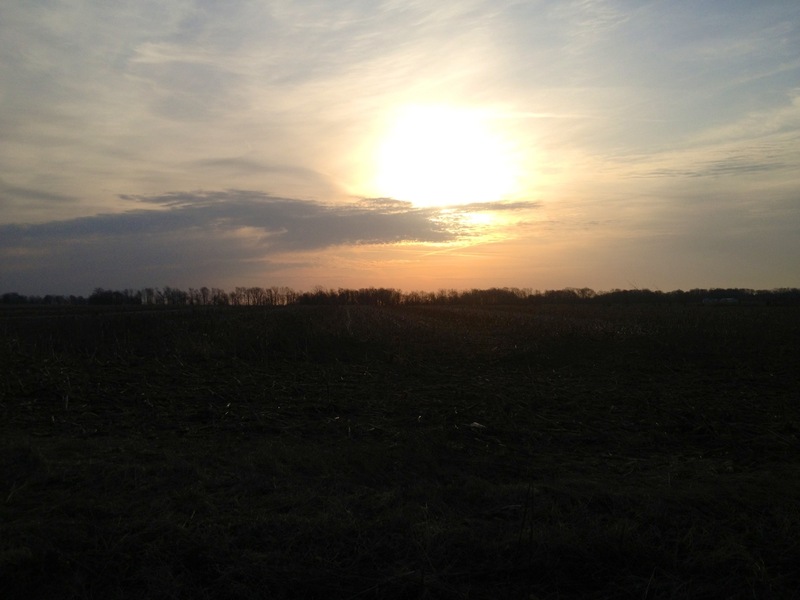 It was a cool, crisp morning with blue skies and large, puffy cumulus clouds overhead. This was definitely the kind of day you want to be on the water- low humidity and a high of 72 degrees. Despite our proximity being less than a mile from US Highway 31 you would never know that you were that close to any sort of civilization. 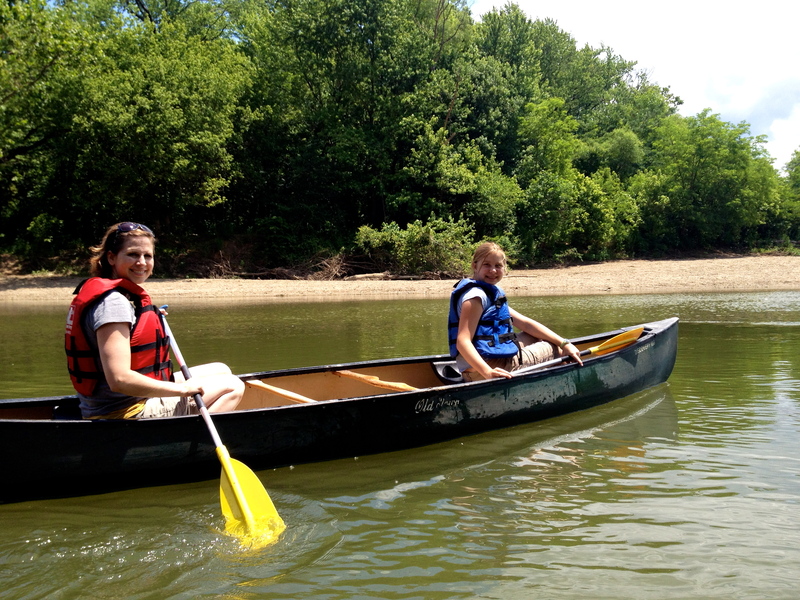 We could have just as easily been canoeing in the Ozarks… being that we were so remote and the river brought plenty of surprises- dozens of nice banks, trees growing out over the river, ducks, snakes, strange looking birds, freshwater mussel shells on the bank, etc. It really caught me by surprise because I really didn’t expect our voyage to be very primitive or exciting… but it really was. The river was relatively low. There were only a few spots where we had to push to get through the rocks, but it was minimal and hardly a hindrance. For the most part, the depth was anywhere from a couple of feet to at least 6-8 feet. There is no doubt that a lack of rain over the last month was a huge contributor to the shallow water but, once again, it wasn’t a big deal at all. In terms of rapids, there were about a dozen areas that would be considered small/insignificant rapids. I will say, however, if you are a beginner you could very easily get tipped without some basic understanding of paddling and positioning your canoe. We were fortunate that everyone put their skills into action and avoided any wipeouts. We stopped on both rock and sand banks to have lunch or to just take a break. The girls had an absolute blast finding freshwater mussel shells, of which they kept, brought home, and cleaned up as souvenirs. If you live in South-Central Indiana and are looking for a 7, 9, or 2-day canoeing adventure I would highly recommend Blue’s Canoes Livery. They make the experience very simple with no confusion. 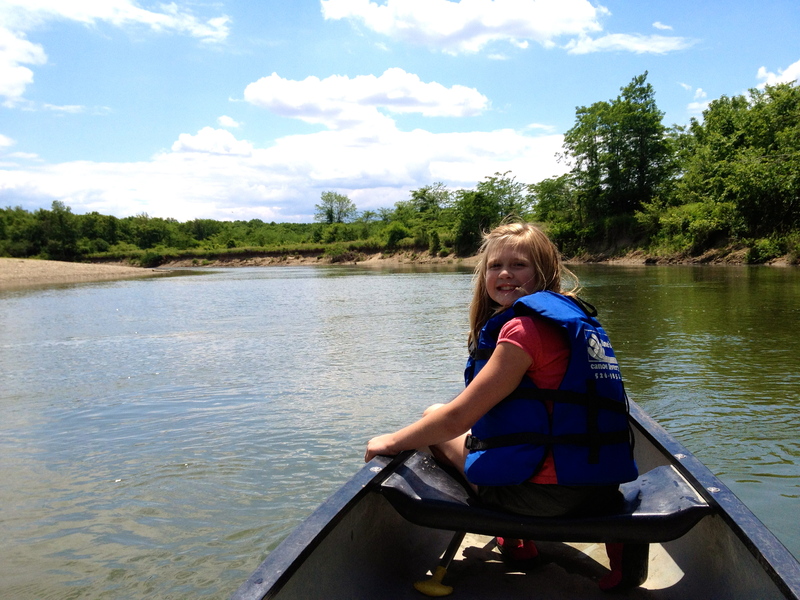 Driftwood River is fantastic for beginner or intermediate canoers or kayakers and/or anyone who wants a leisurely trip on the river with minimal effort. While this is far from a Colorado River experience, it is a great and accessible place to get lost in nature for a bit. I am hoping that our next canoeing trip on the Driftwood will be the two-day overnight camping on a sand beach. I will keep you posted! 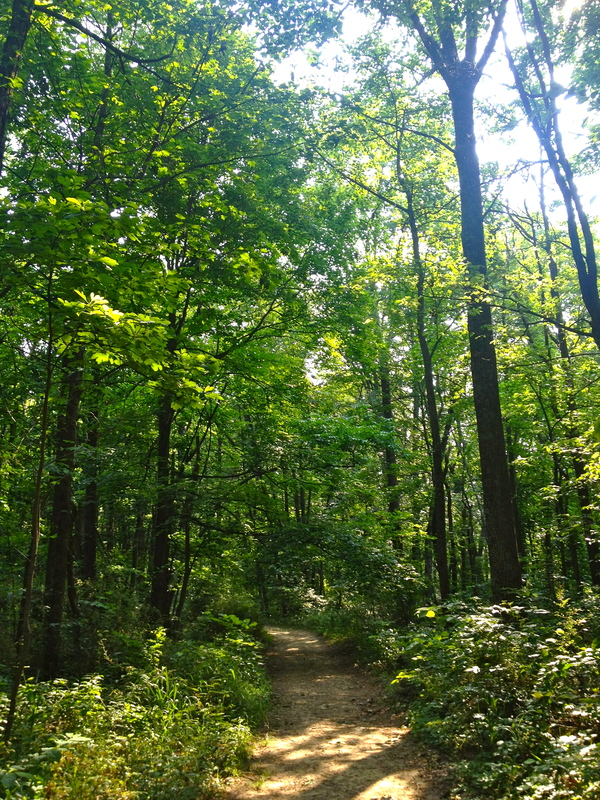 Will and I traveled to Brown County State Park early this morning before it got too hot in order to hike the 2.2 mile loop simply known as Trail 10. The early morning temperature forecast showed 85 degrees but this trail has excellent tree covering so i knew it would be a bit cooler. 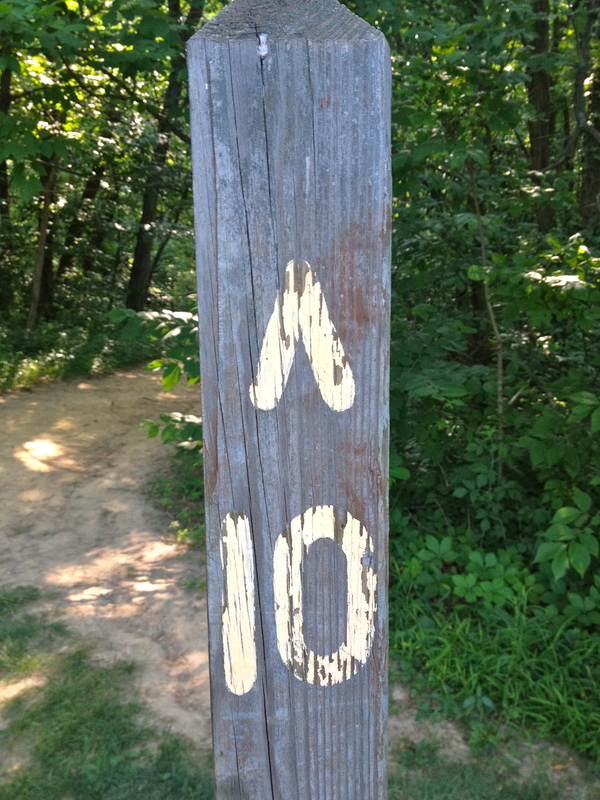 Trail 10 is extraordinarily well-maintained only narrowing in one spot on the back end of the loop. 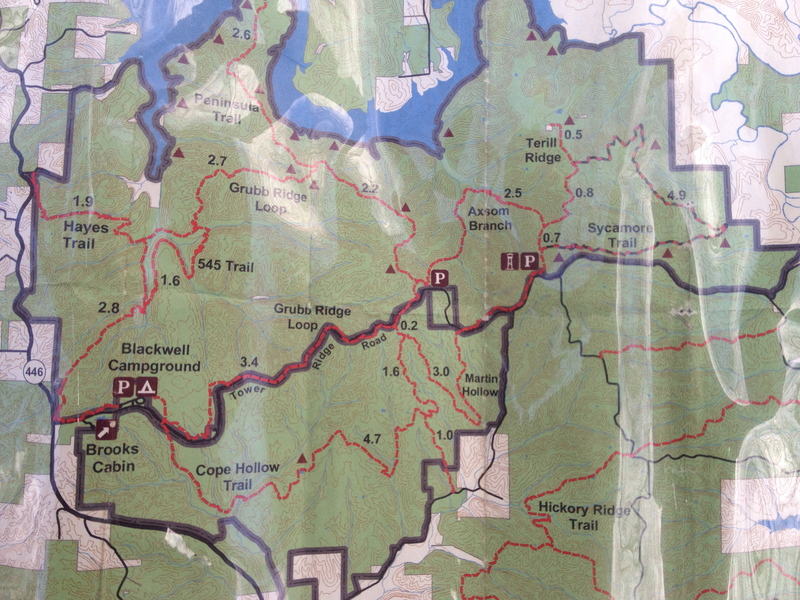 The specs on this trail list it as a moderate trail with 400 elevation descent and ascent. I would probably describe this trail as leisurely with very gradual elevation changes over the 2 miles. The temperature stayed at about 75 degrees but I worked up a small sweat with it being quite humid. It is an understatement to say that our lives are full of chaos. We do not take the time to stop and realize how dependent and addicted we are to the noise and the rush around us. Every minute of the day is full noise and busyness. It is the television, music, conversation, kids, and incessant chatter. When we finally come up for air we gasp, “God, where are you? This hardly feels like the abundant life you promised. Where is the peace?” We don’t stop to think how our minds have become so conditioned to the three second snippet or the fast paced motion of life. It is no wonder we are so anxious, impatient, discontented, addicted, and medicated. My God, where is the peace? Think about how this affects us. We do not stop to listen to others. We are constantly thinking about what we are going to say next or do later or the next thing on our schedules. We are unable to concentrate and sit in silence and just listen. We have to speak. We have to turn up the volume. Is it not true that we live lives that make it seemingly unable to quiet those things around us and those things in our heads? We are unable to just sit still and breathe, contemplate, find peace, and hear God. In solitude and silence, we intentionally remove ourselves from everything and everyone for a period of time. We cut ourselves off from everything we have become dependent upon or addicted to…standing still and alone with God. Solitude and silence strips away everything that we have filled ourselves with and leaves the infinite void of our soul wide open and exposed…preventing everything but God to fill us. In solitude and silence we realize that there is no thing or no one to trust in but God alone, and this is an excellent beginning point for all of us. 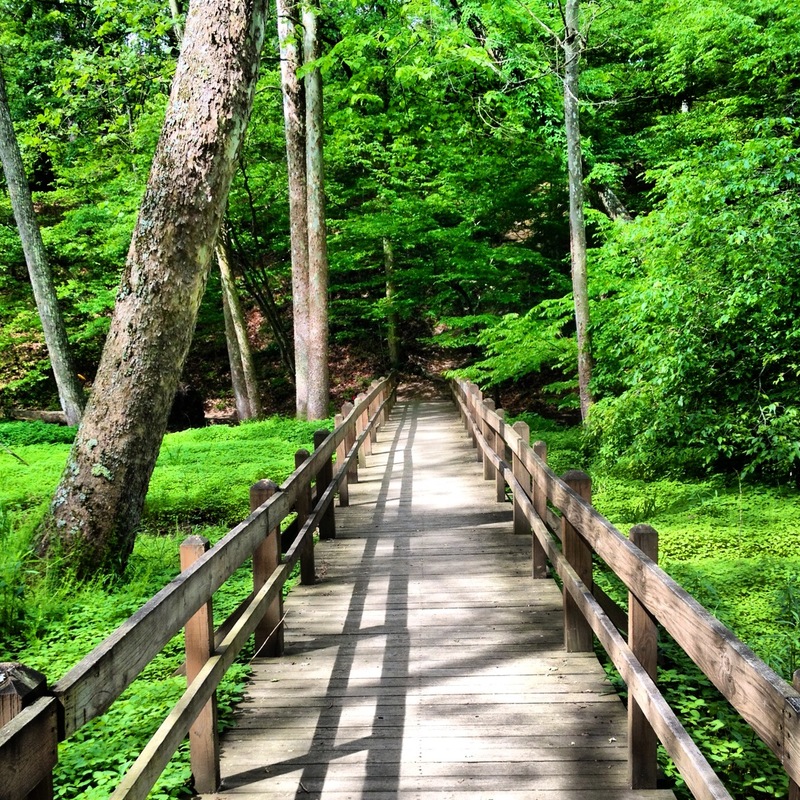 Today I am thanking God for the peace and solitude of the leisurely Trail 10. Since my last post a couple of months ago I have spent the majority of my time getting in shape for the big Rocky Mountain hike coming up in July. Finding significant elevation in Indiana is a lost cause, especially in the elevationally challenged city of Columbus. 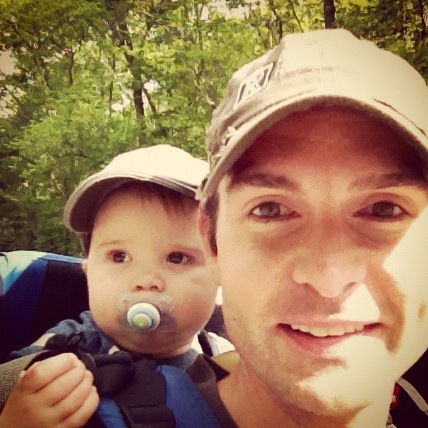 As a result, I decided to load up my heavyweight 10-month old son, Will, in an infant backpack and climb the 100 foot lookout tower at Mill Race Park. We go up and down and up and down and up and down. He loves it. It helps me. And it gives mom a break. Win. Win. Win. 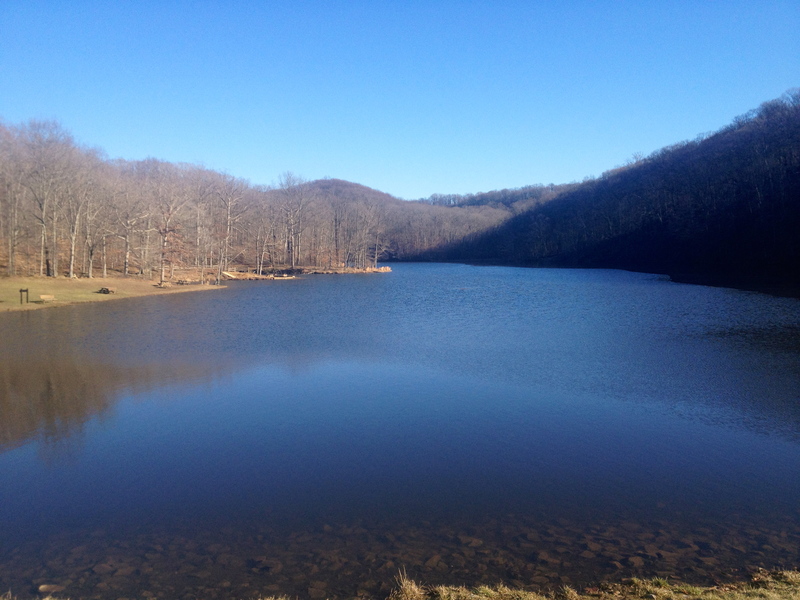 Yesterday, instead of hitting the tower, Will and I jetted over to Brown County State Park for what I believe was our first official hike together. 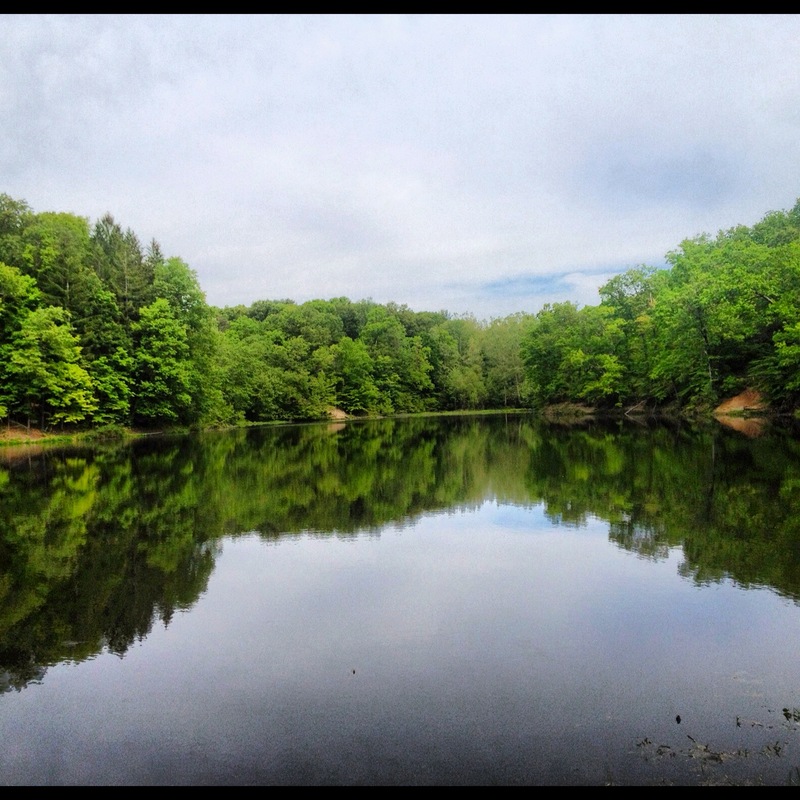 We left early and headed to one of my favorite loops in the park… Strahl Lake. It is simple but beautiful in the early Spring. 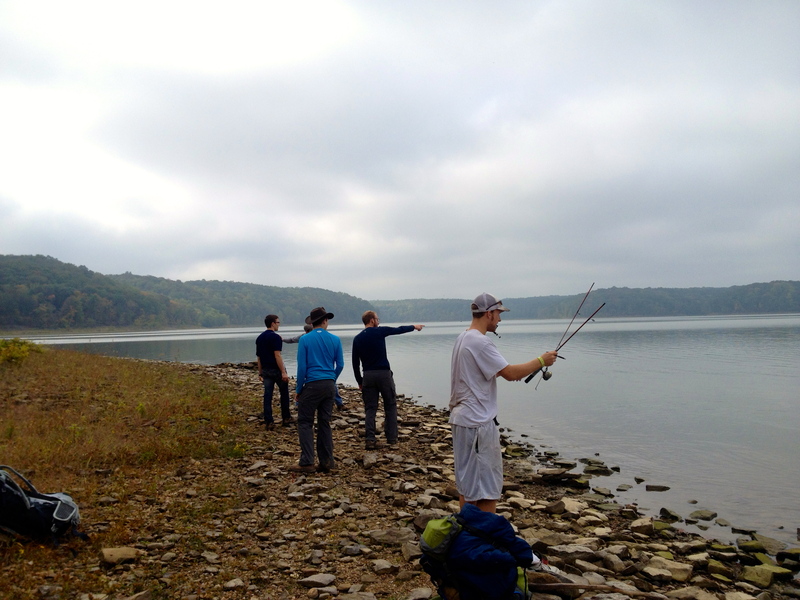 It was a busy morning at Brown County State Park. 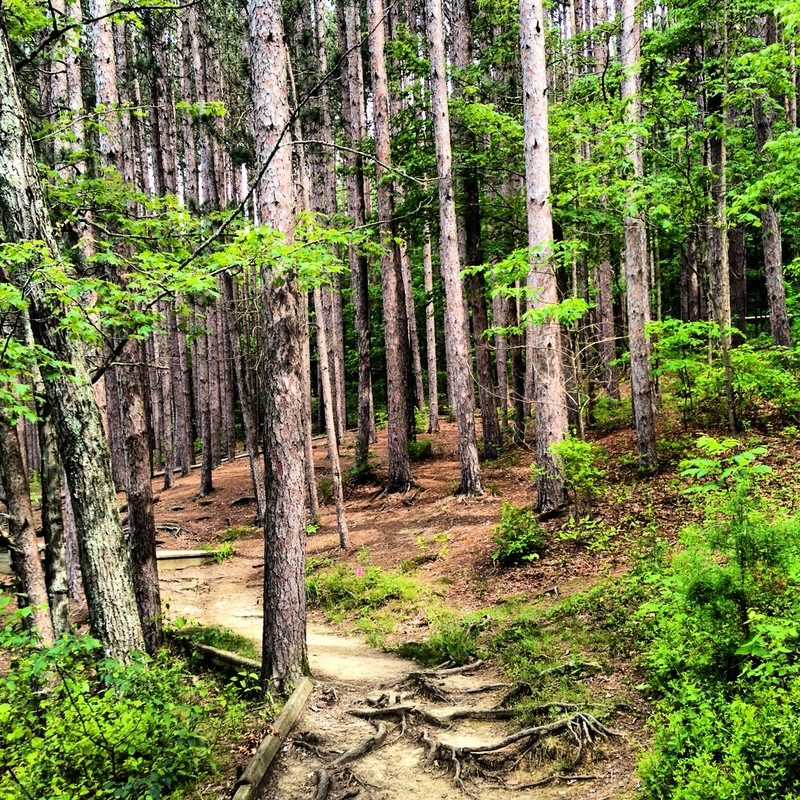 One of the most exciting trail races, Dances With Dirt, would be sharing the trail with us. It was really cool to see all of the runners struggling while we were breathing easy and enjoying the cool morning.. haha. I was preoccupied with my new fascination with foraging. I have been studying simple plants and weeds in our natural environment that are edible. While I am still not sure if I can identify Stinging Nettle, I have a new love of Yellow Wood Sorrel. That little weed has a nice soury pleasant taste and is high in Vitamin C. Good stuff! 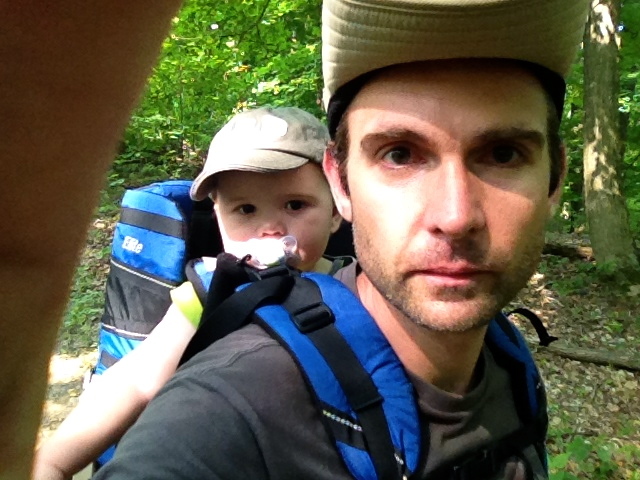 Anyway… Will and I enjoyed our first hike together around Strahl Lake. He was captivated by the birds chirping, the green plants, and the splashing water on the lake bank. It was a great morning. 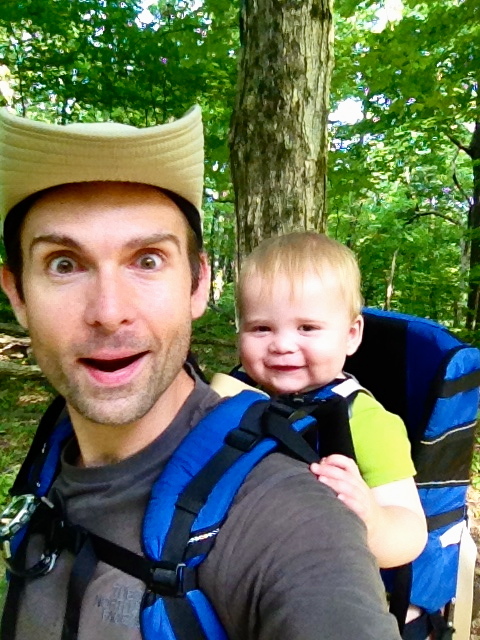 I am heading to Red River Gorge next weekend and will be updating the blog when I return! 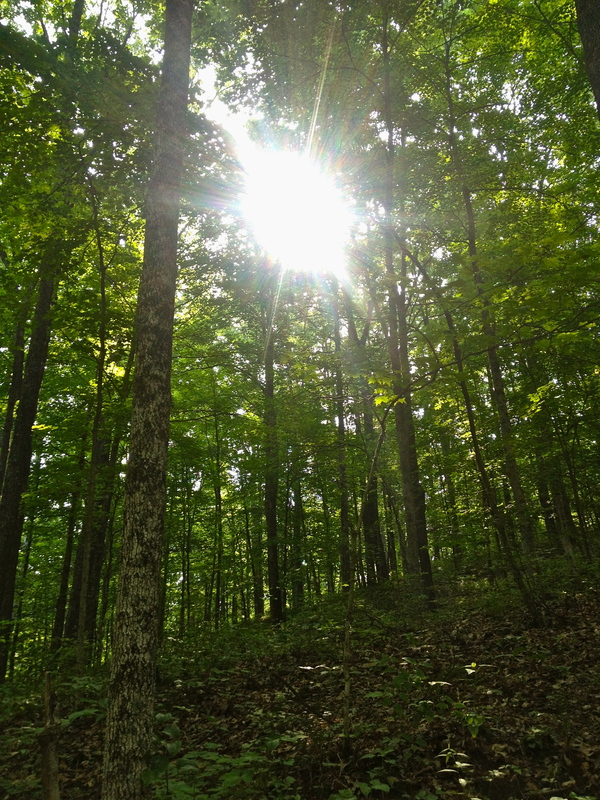 The date of this weekend long trip to the Charles Deam Wilderness in the Hoosier National Forestry south of Bloomington, Indiana was chosen before the full extent of the weather was forecast. 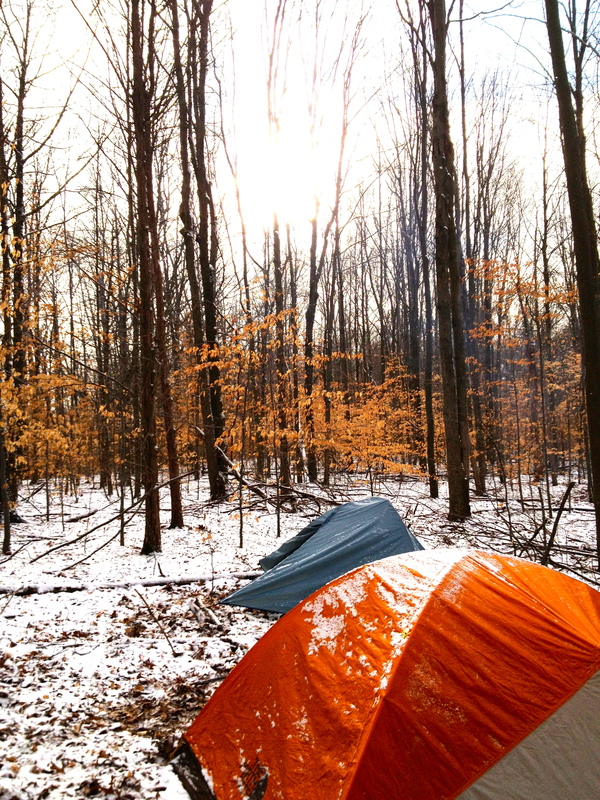 And as our trip date approached it became apparent that only two words were needed to describe our weekend: very cold. 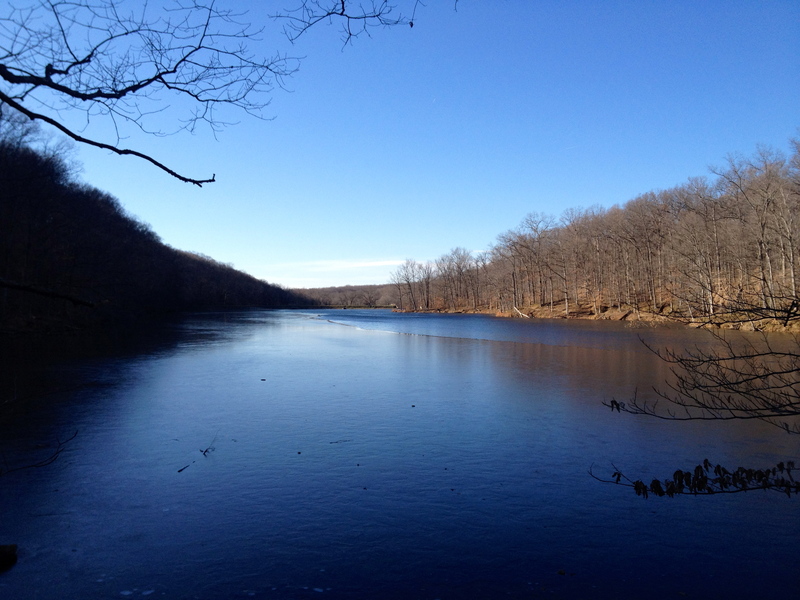 The high was forecast in the low 20’s F and the low was forecast in the single digits. We arrived on a dark Friday evening at about 7:30pm and were already in the midst of a moderate snowfall with a temperature just below freezing. 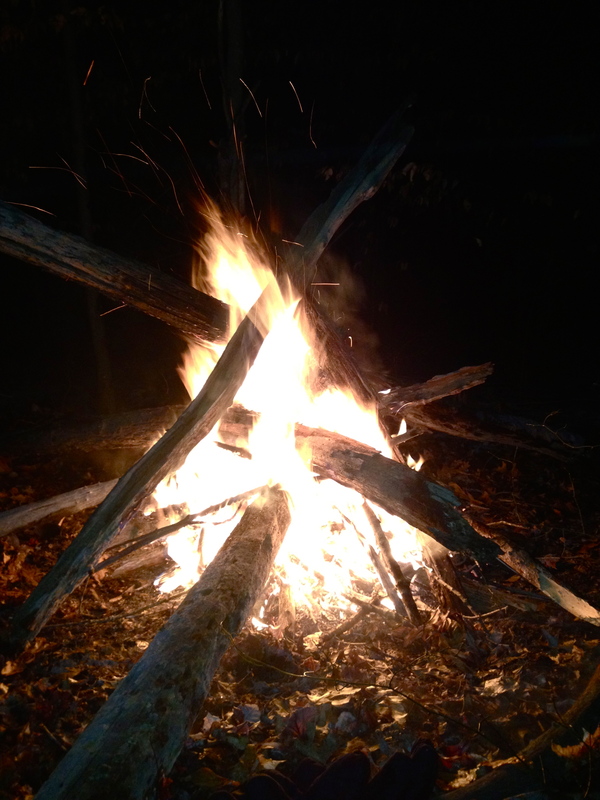 Obviously our main priorities for the night were to get to our camping location, set up our tents, and start a fire. Our hike started in the parking lot east of Sycamore Trail. 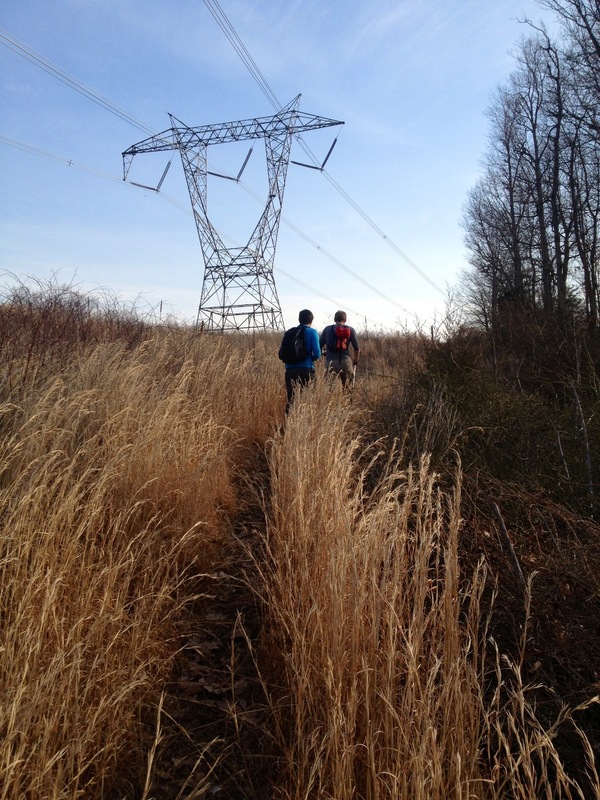 We wanted to get a little more than a couple of miles into Sycamore Trail before setting up for the night. Our excitement and energy were more intense than the snow and cold. We jumped on the trail and got moving. 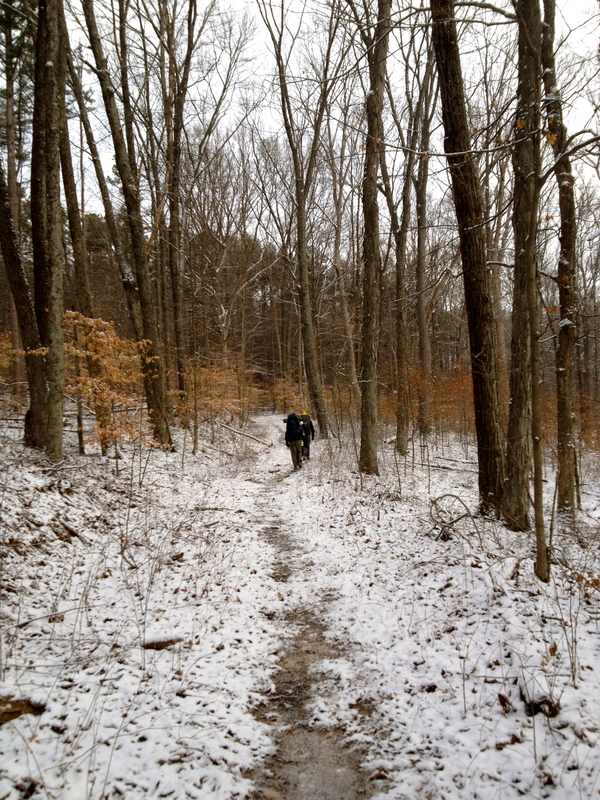 The trail condition was as good as it could have been considering the conditions. 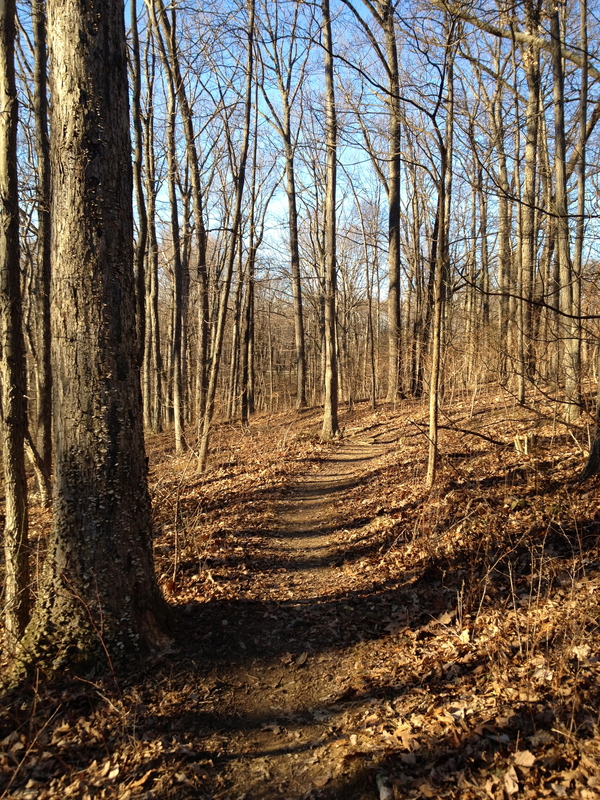 Since the temperature had just fallen below freezing, and being that we have had an unseasonably warm winter in Indiana, the trail was a bit muddy… but not inhibiting. It didn’t slow our pace as far as I could tell. 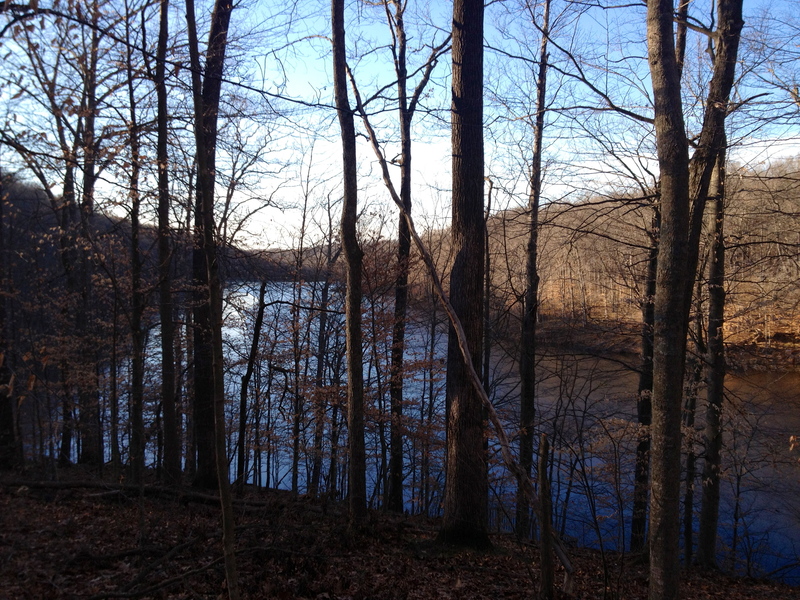 As would be the case throughout our hike, the elevation changes were minimal, but very enjoyable. The next 100 minutes of hiking really flew by. The only stop we made along the way was to look at a mouse that had climbed up a small tree. He was just chillin’ and watching it snow. 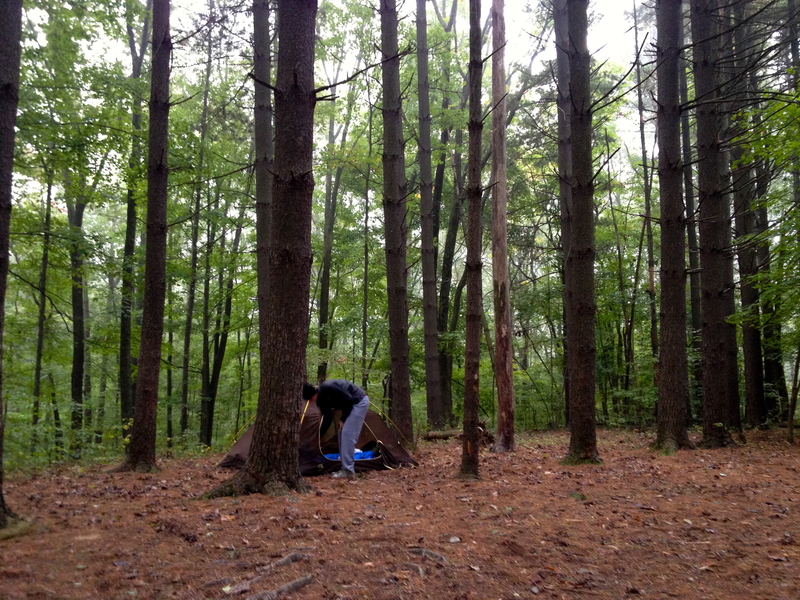 We left him in peace and made our way to our camping destination. We quickly removed the debris from the area and set up our tents. We knew the more difficult task would be getting a fire started when everything was relatively wet. We began gathering as much dry material as we could, from the ground and our packs, and within 10 minutes we had a really nice 3-foot fire. We ate a bit, chatted, and warmed up. Even though the temperature and snow were falling around us, spirits were high and we looked forward to a productive hike the next morning. We woke up Saturday morning to a bone-chilling 11 degrees. My mummy bag worked well but for some reason my toes were really frozen. We crept from our tombs and made our way to the once raging fire pit and began to stoke it back to life. It wasn’t long before we were warming up and enjoying some breakfast and coffee. 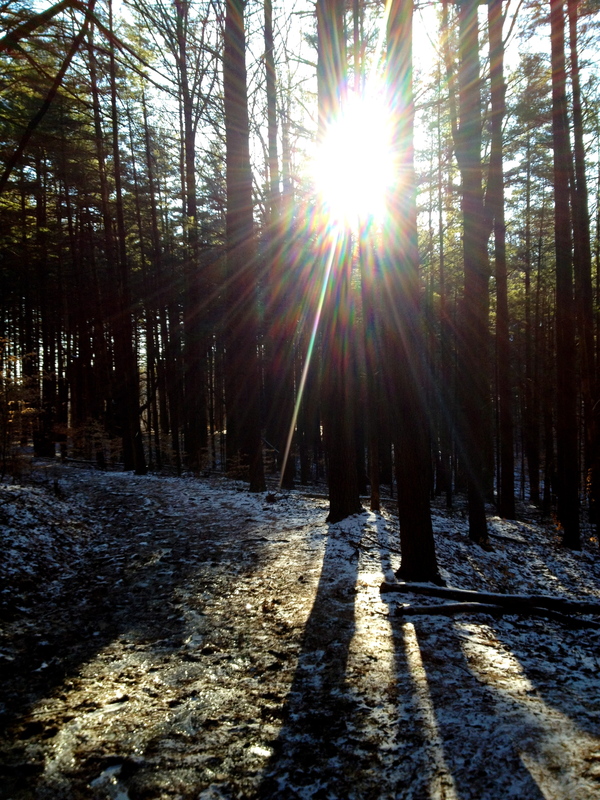 The truth is that what REALLY warms a person up is…hiking. 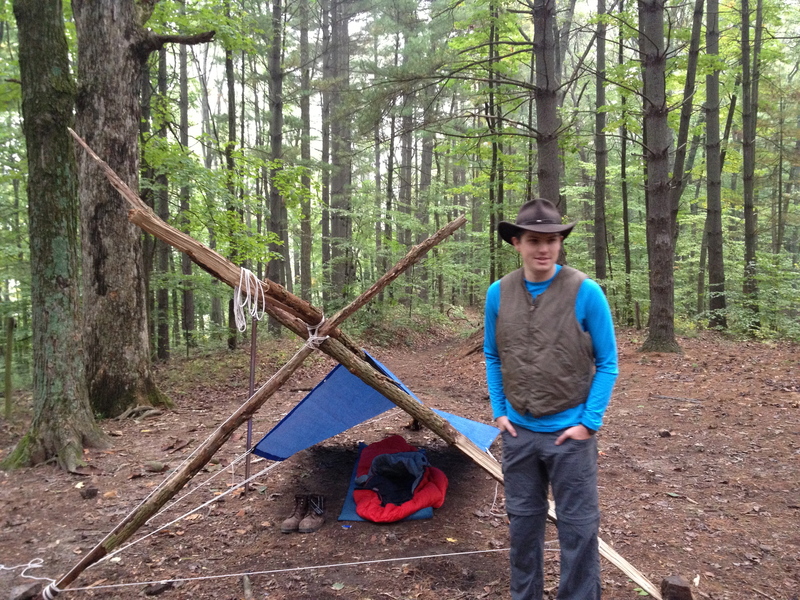 We broke down camp, put the site back to it’s original form, and then geared up. 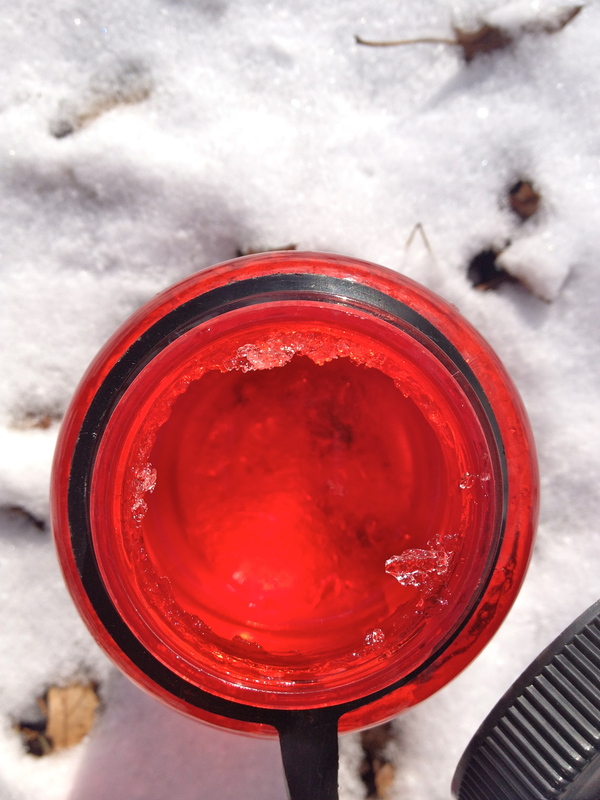 We hit the trail and it wasn’t but ten minutes before my blood was pumping…warming everyone extremity on my body. We follow the remainder of Sycamore Trail loop, which was comprised of a relatively flat, wide trails, a few downhill switchbacks, and one steep ascent. The beauty of Sycamore Trail and Axsom Trail, which we would be connecting to later, is the stunning pines that line the trails. Even in the cold of winter the pine smell is just refreshing and reminds me why I am enduring the cold. It is a magnificence and a beauty that is uniquely different than spring, summer, or fall. 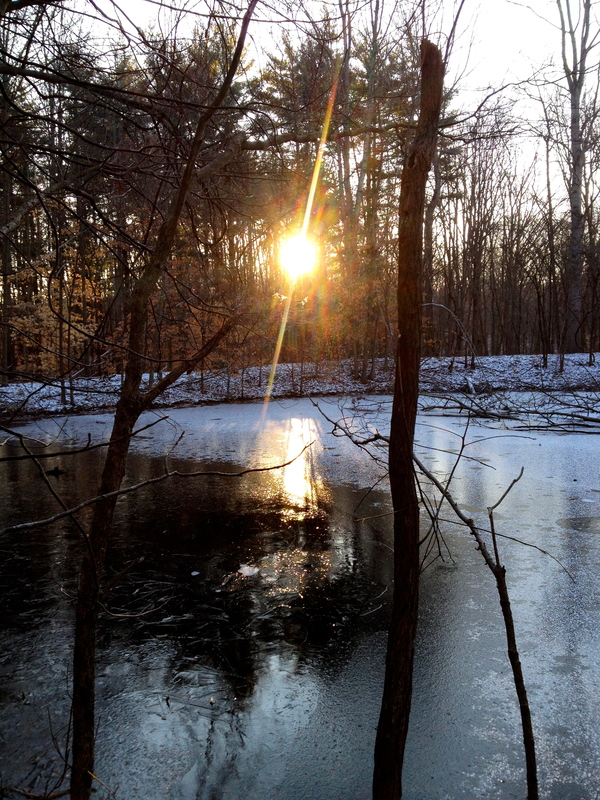 It would be a mistake to avoid winter hiking for fear of being cold. Closing your eyes, breathing deep the cold air, smelling the crisp, clean pine, and feeling the blood warmly pulsate through your body in the frigidness of winter reminds me that I am alive. It is good. 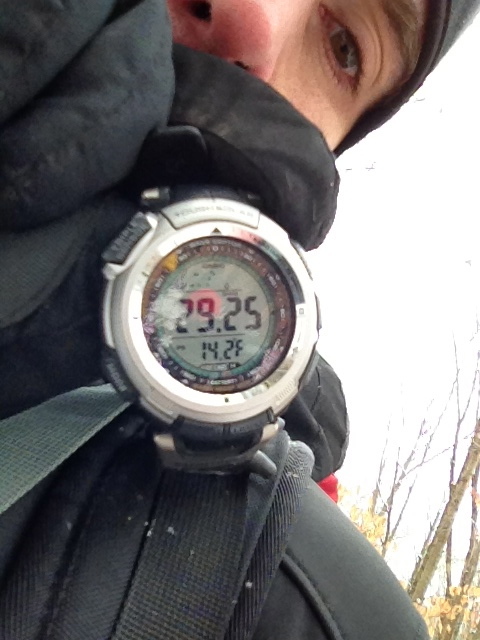 In total we had covered roughly 7.5 miles before we settled on a campsite on Axsom Trail. We found an extremely nice spot in the middle of some pines right next to a small pond. Before setting up the tent we made a huge bed of pine needles as a cushion and then set the tent up on it. We got another raging fire going and settled in for the evening meal and conversation. 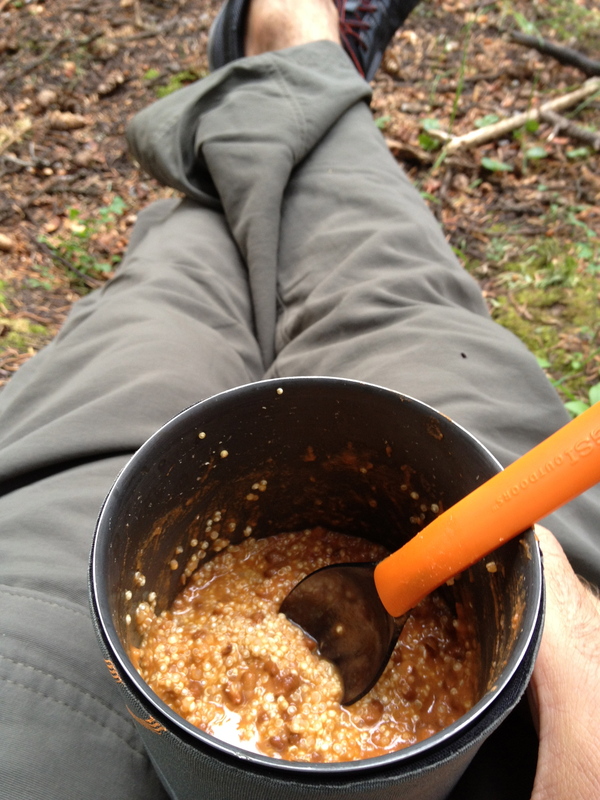 Wild mushroom and herb couscous was on the menu for me…and I was really excited about it. Two days of Clif Bars, almonds, and cranberries makes one crave some flavor! In an Indiana winter it might be 50 degrees by day and snowing a foot by night. It is completely unpredictable. 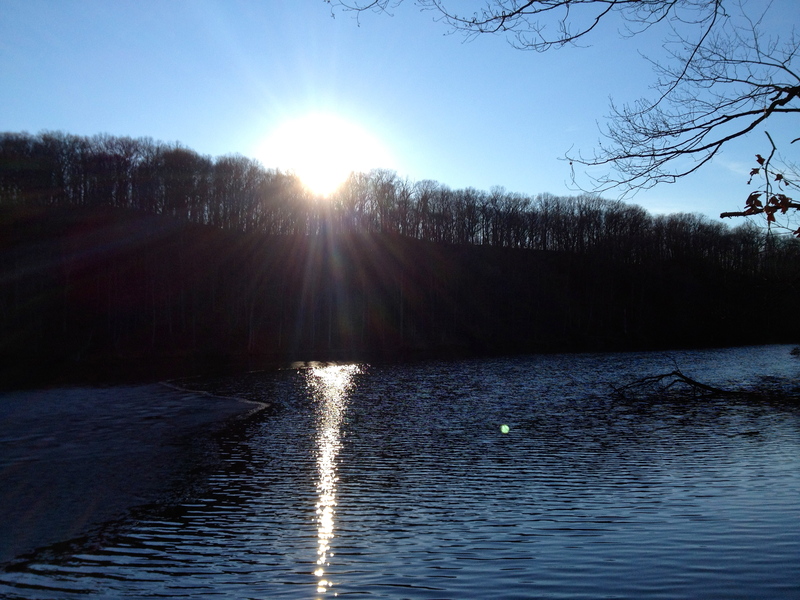 But when nature blesses you with a temperature 25 degrees above the seasonal average…you better be outside enjoying it! 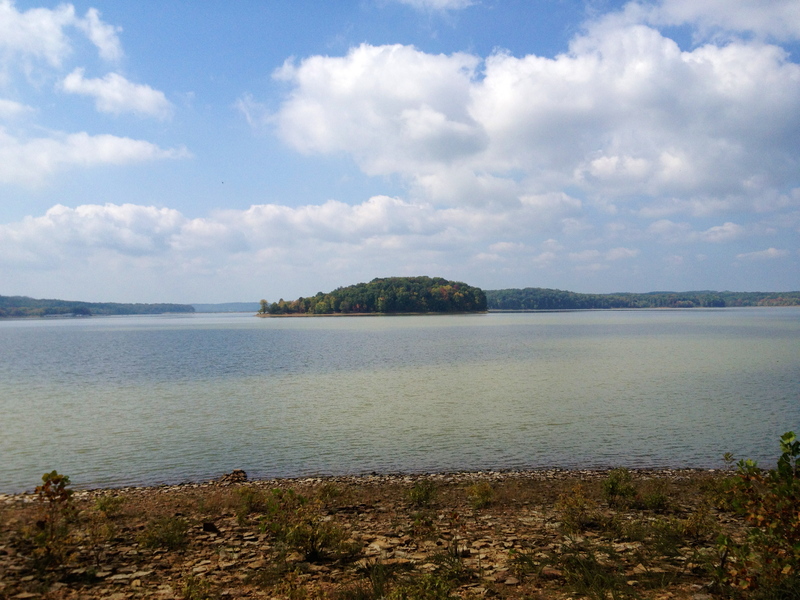 I jetted out to Brown County with one of my good friends, local craft brewer Jon Myers. 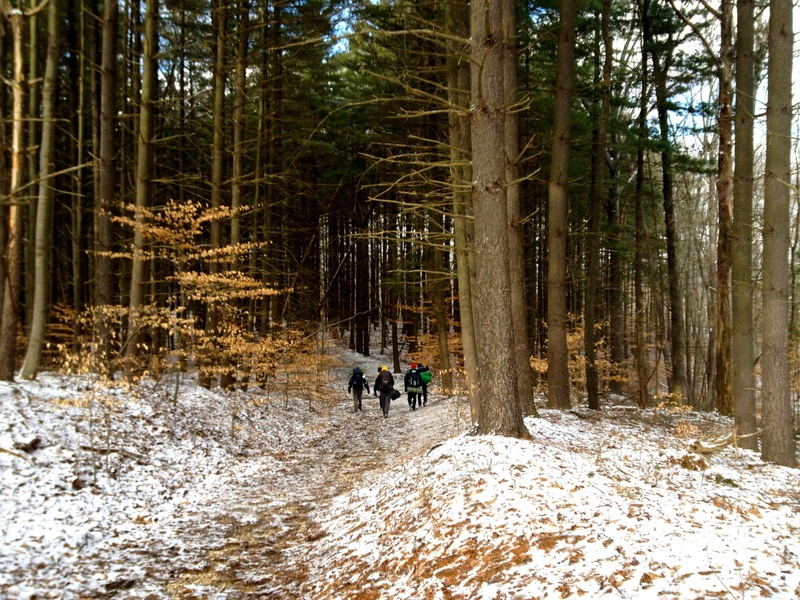 Our plan was nothing more than to get out, breathe deep, and enjoy a brisk hike. 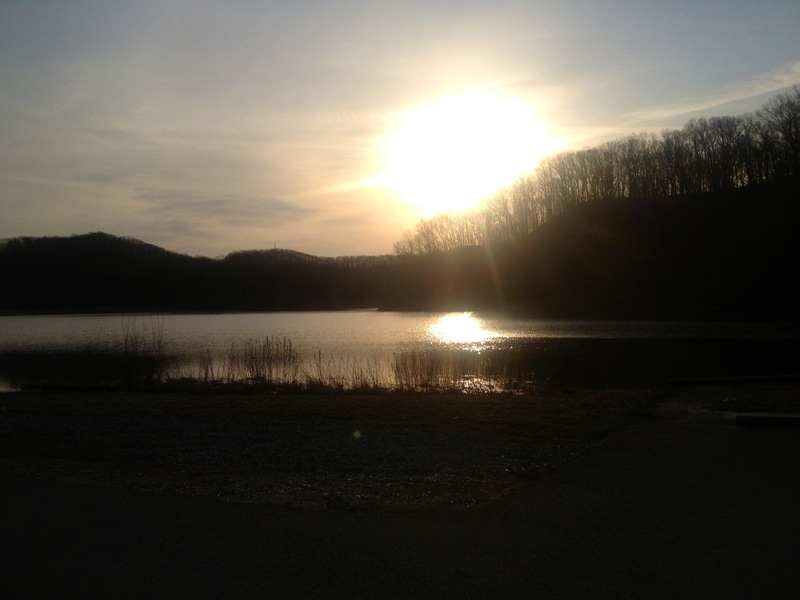 For as lush, vibrant, and alive that Brown County State Park is during the spring and summer… winter is a completely different story- there is not one leaf on a tree. For a place that is renown for rolling hills clothed with the finest green that nature can afford… winter strips the hills in haunting nakedness. 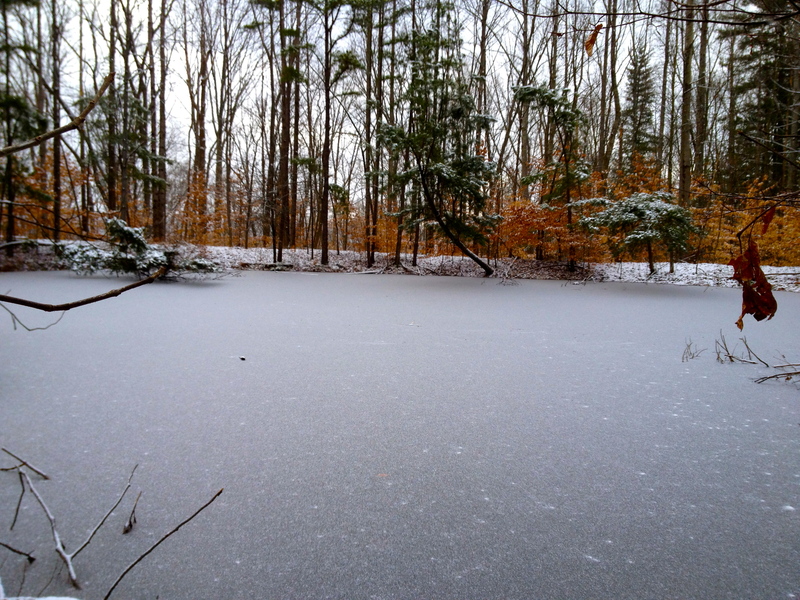 While far from it’s full glory, there is a simple beauty resident in a Brown County winter. We started off on the northwest corner of Ogle Lake and took Trail 7 (which winds all the way around Ogle Lake) until it connected with Trail 4. 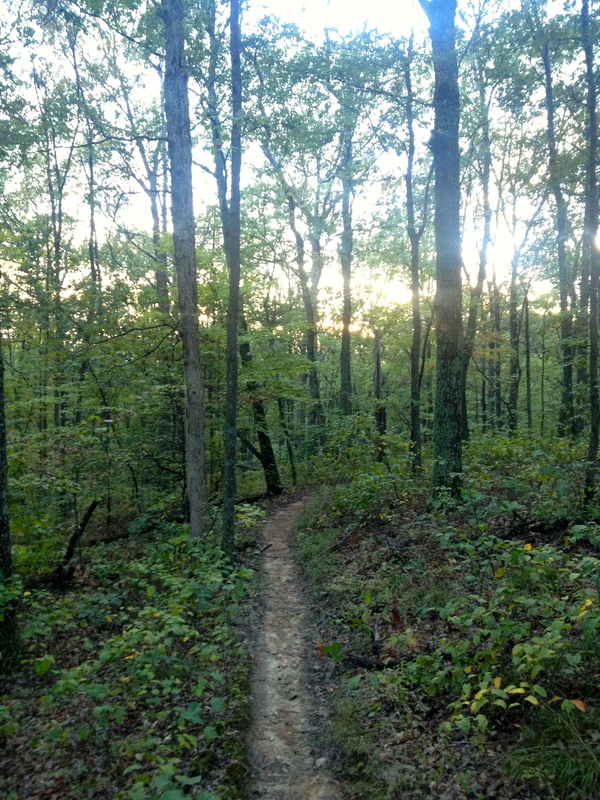 As we broke off onto Trail 4, the trail stayed relatively flat with a few small elevation changes. While the leaves covered both sides of the trail, I was a bit surprised how muddy the trail was. This was my first hike in my new Merrell Outbound Hiking Boot that I got for Christmas so the mud was sure to initiate them. 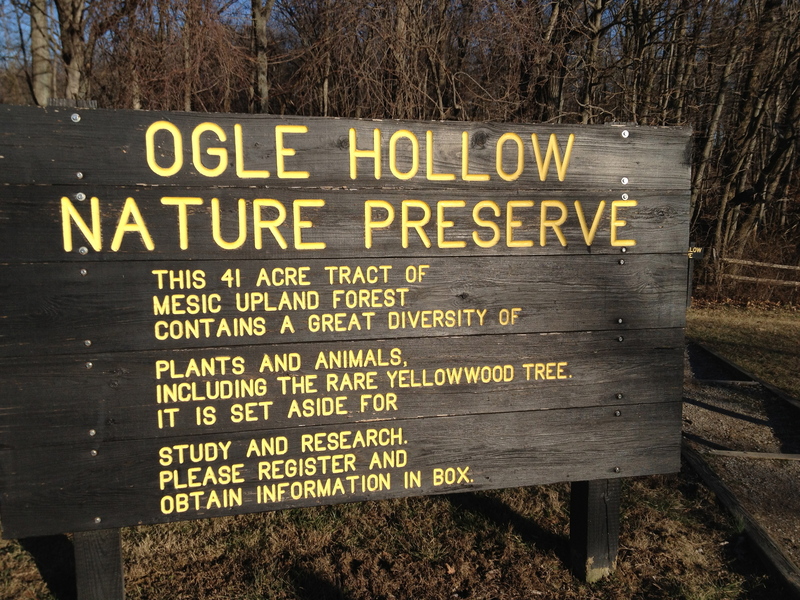 We soon connected with Trail 5 and we worked our way into the Ogle Hollow Nature Preserve. The trail began to ascend along the side of the hill and continued about 300 feet upward until we reached an opening at Rally Campground. We stopped for about ten minutes at the top and then continued our loop by connecting to Trail 4 again. This trail would take us back to Trail 7 and then Ogle Lake. Most of this section of Trail 4 was downhill. I thought that this was a really nice section of Trail 4. 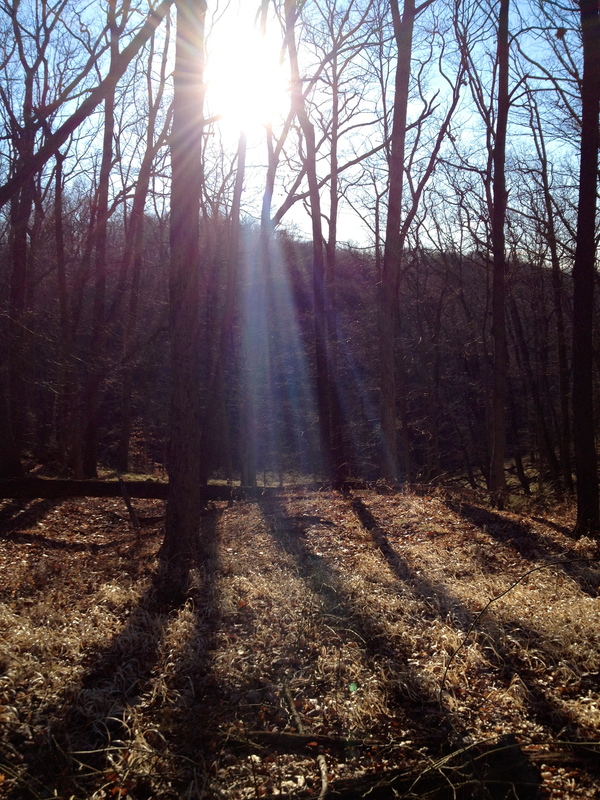 The warm sun was beaming overhead and we took a leisurely pace to soak it in and just be at peace. Ogle Lake was soon in sight and we connected with Trail 7. The last leg took us the rest of the way around the lake. The beavers had obviously been busy as there were several trees down and several trees that had been gnawed fairly significantly. We finished our 3.75 mile hike and made our way back to the parking lot. Hiking in the barrenness of winter definitely gives me an overwhelming sense of stillness, contentment, and simplicity but more than anything it produces a longing within me for spring… for rebirth and life… and that from death… something below the surface is waiting to awaken… and when summoned to come forth… life explodes and abounds. Praise God for winter and longing and hope and anticipation and this profound sense of expectancy down deep in my soul. 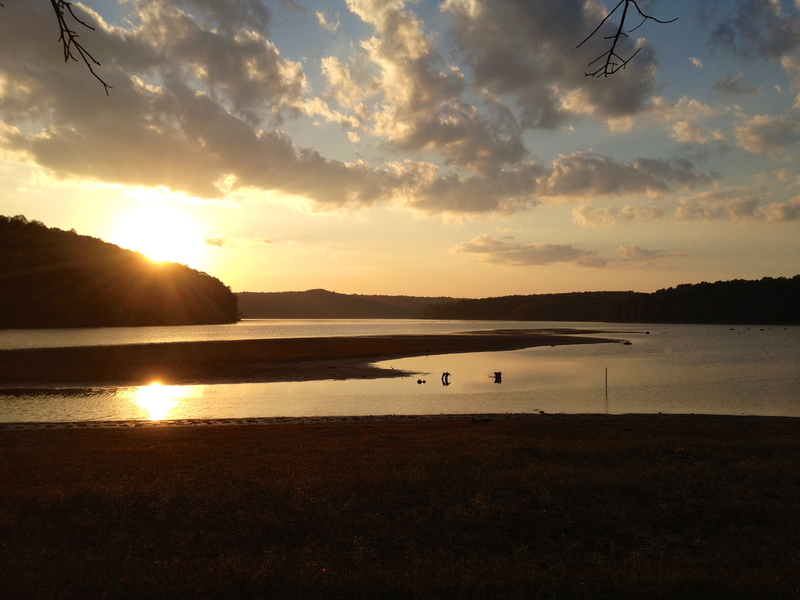 The last place I expected to have such an incredible time hiking, camping, and canoeing was Arkansas! Being from Indiana, I romanticize about spending time in wildly diverse terrain with many things to see and experience…but no one could have ever convinced me that the northwest corner of Arkansas would be such an amazing outdoor playground. Yes, Arkansas! 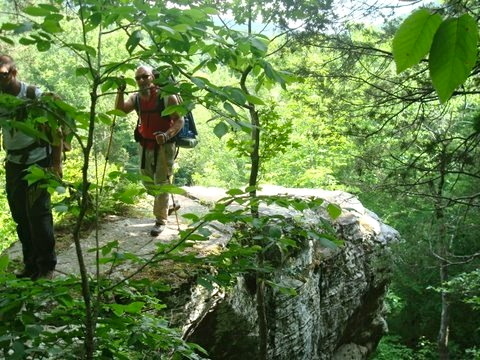 In my research the Buffalo River Region in the Ozarks always ranked really high among hikers. 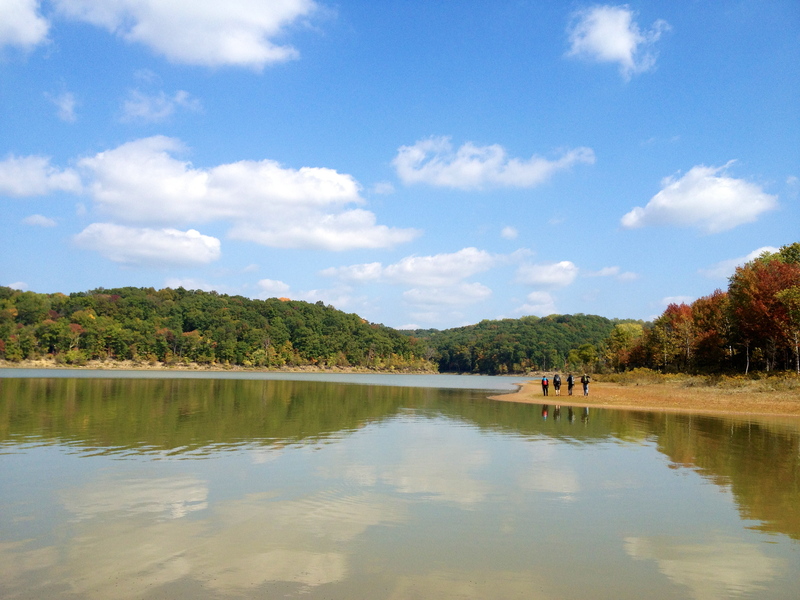 Many people wrote about the sheer bluffs, the great trails, the special scenic spots, and the adventurous Buffalo River. 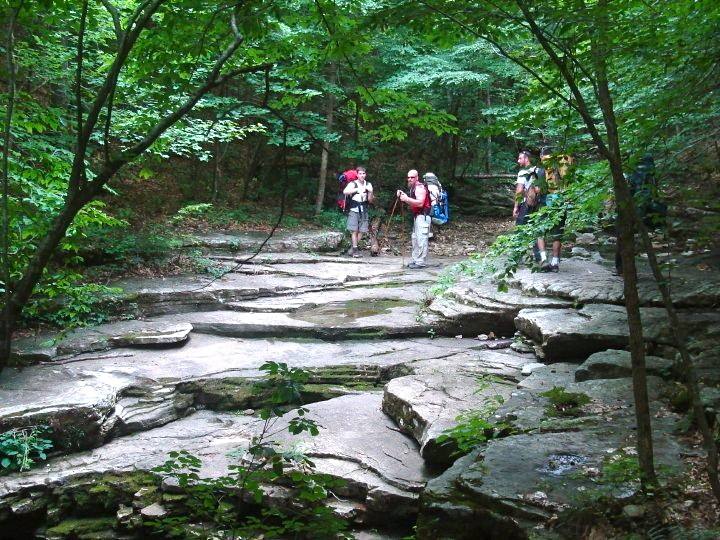 In fact, this particular area was ranked by Trails.com as one of the Top 100 trails in the United States. 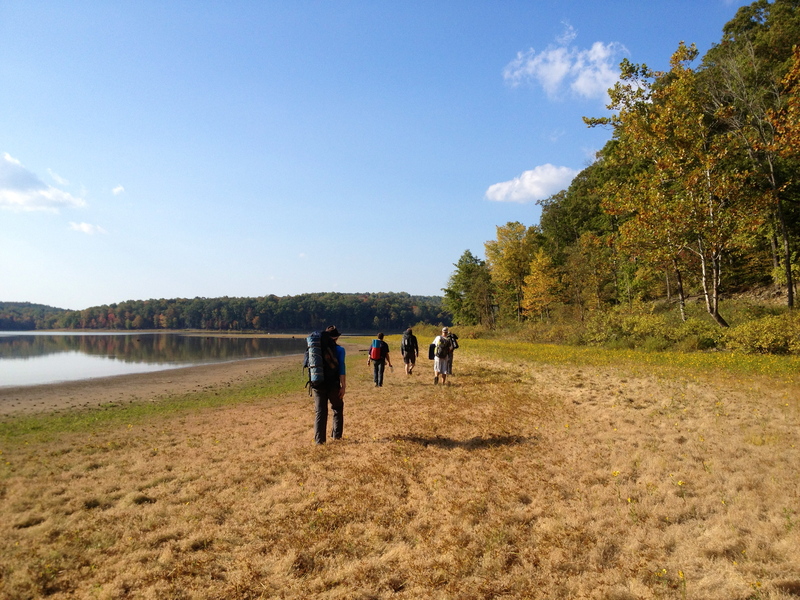 Our plan was to spend two days hiking and two days canoeing. 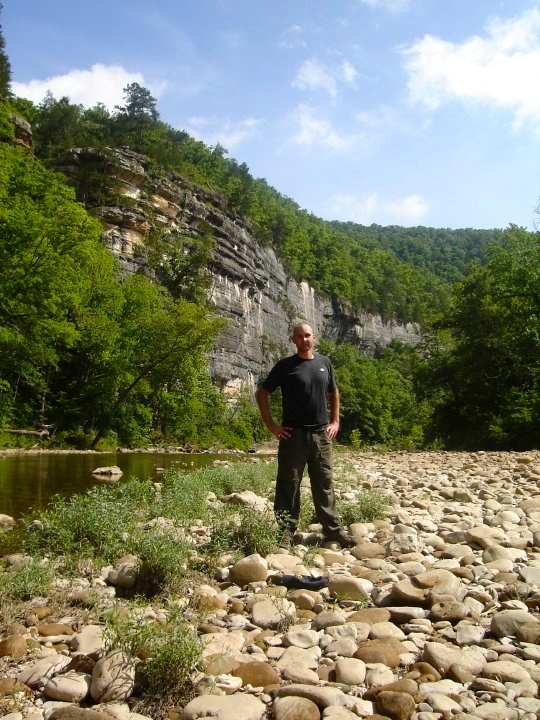 We would leave Ponca, hike ten miles to an area close to the unbelievably scenic Hemmed in Hollow, camp overnight and then hike back to Ponca via an alternate trail. 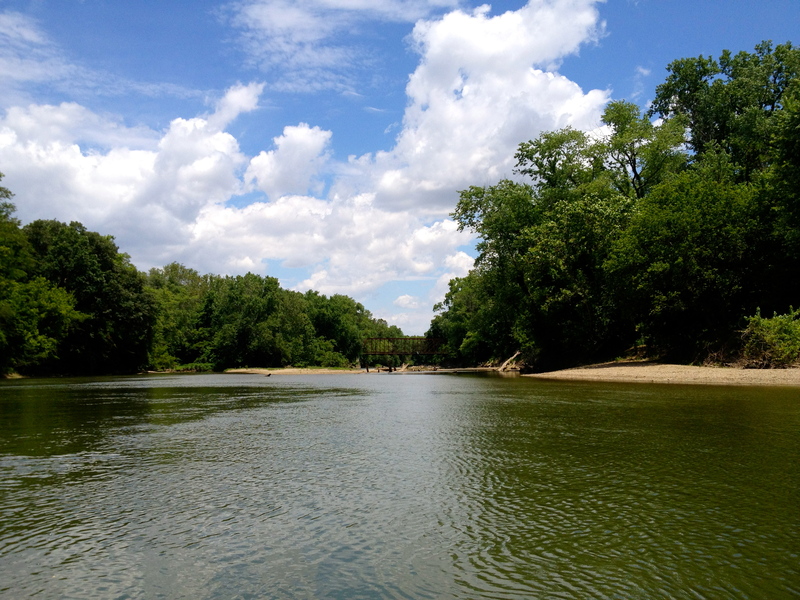 We would then spend the night in Ponca and leave for a two day canoeing trip ending downstream at Kyle’s Landing. 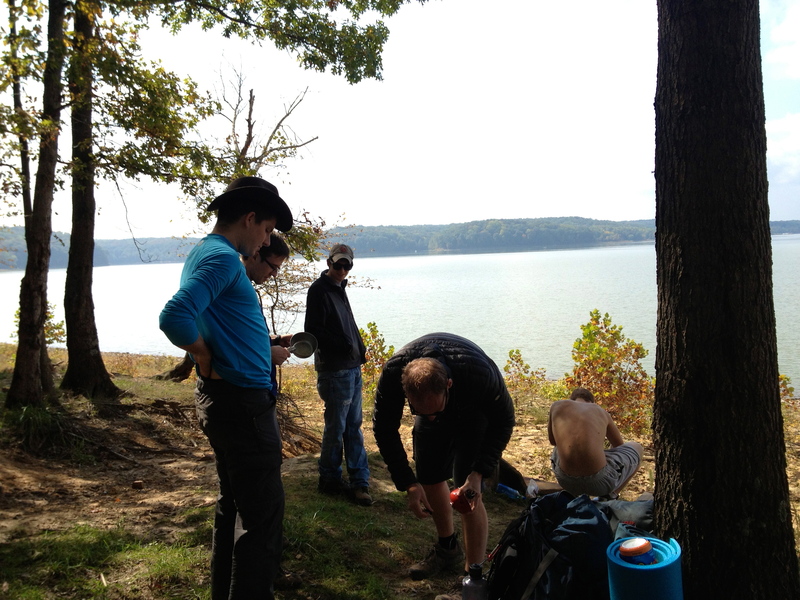 We assembled and geared up near the Ponca Bridge. There are a couple of things to note quickly. There is an outfitter close by the Ponca Bridge and I recommend asking if you may park there. The bridge parking lot is known to flood unexpectedly and you don’t want to leave your car there. Also, in the evening near the bridge area the wildlife really come out. 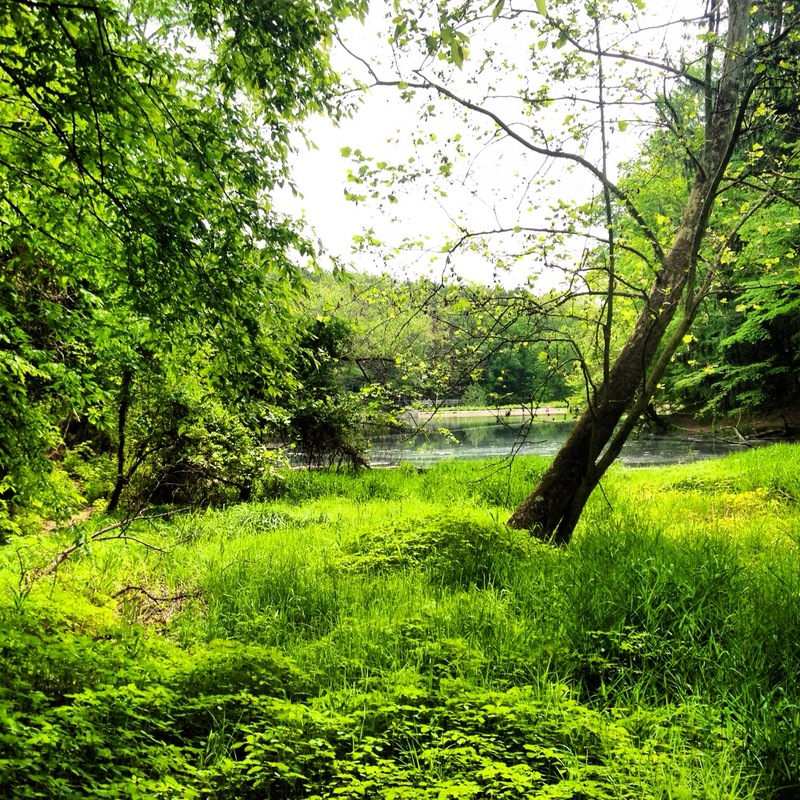 This area is really peaceful and serene…enjoy it! 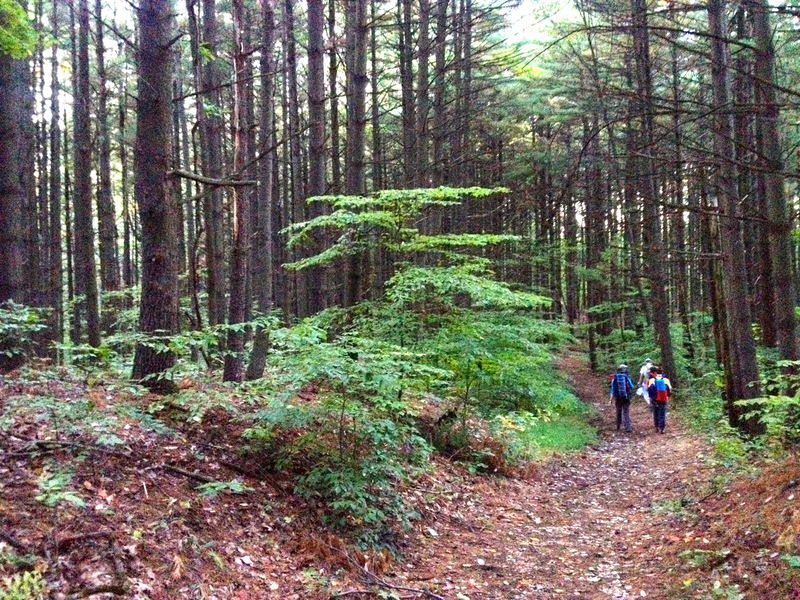 It didn’t take long down the trail to feel as if we were completely out of civilization. 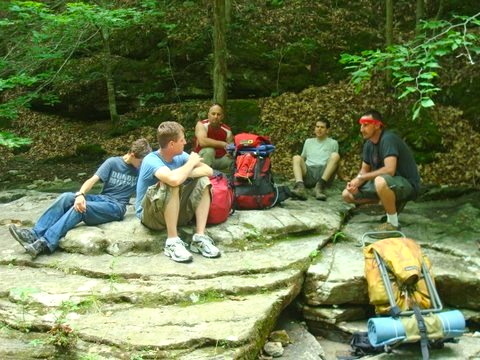 We were fortunate that we were hiking during the weekdays and the activity level in the area was at a minimum. The trail floor was carpeted with moss and lichens as we climbed up along the bluff line. 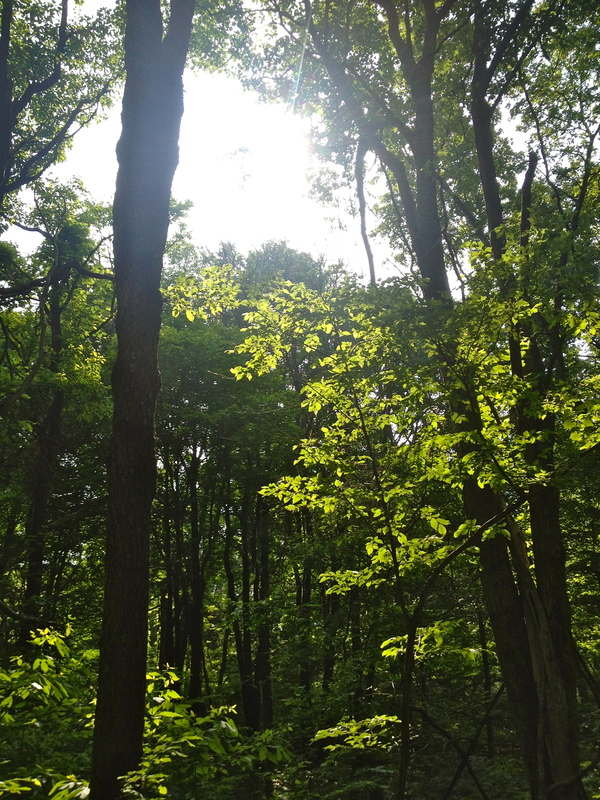 We were in and out of the tree canopy and we could tell it was going to be a hot June hike. 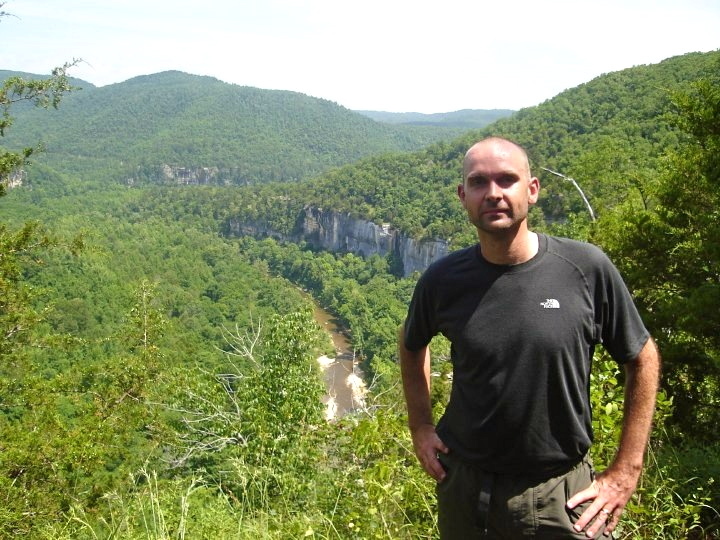 As we elevated from about 1000 feet at our origin to about 1400 feet at the top of the ridge line…there were some real opportunities to see a more expansive view of the river and other bluffs. 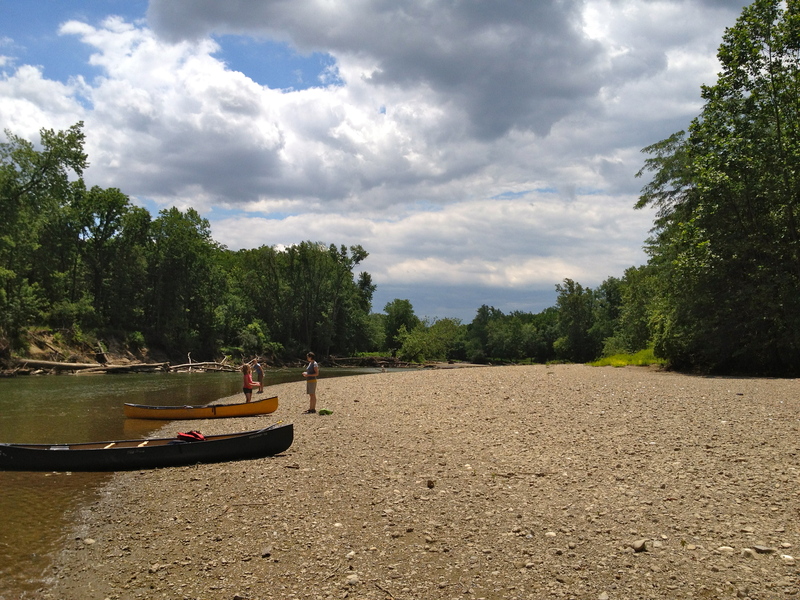 At Steel Creek everything opened up as we approached the rock bank on the rivers edge. Roark Bluff stood proudly on the other side in her magnificence. 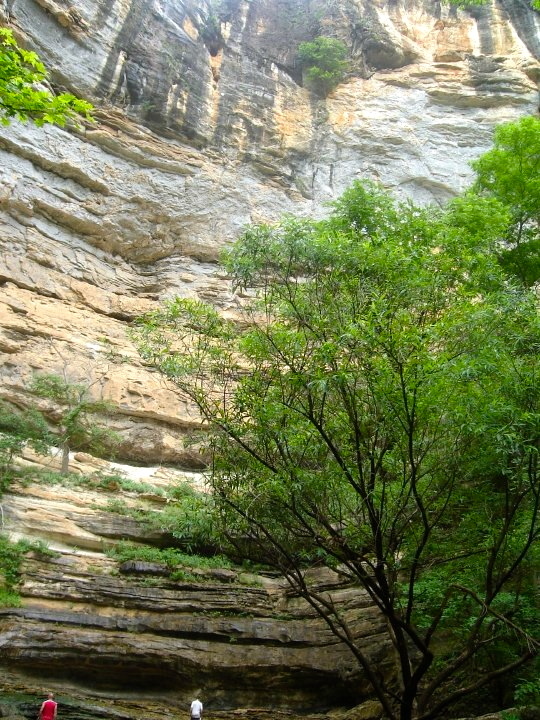 We stopped for a few minutes to take in this picturesque view of this towering bluff brooding over the Buffalo River. When you are surrounded in this much beauty you have to just soak it in and marvel…and this was just within the first two miles of our hike. As we marched on from Steel Creek the trail ascended and descended before leading us up once again to another river overlook and then Big Bluff overlook. If this trail promised us nothing else it would certainly deliver on amazing bluff views from every vantage point. And as breath-taking as all of these views were…our biggest surprise was yet to come. But there was some work to do in front of us. We had to climb a thousand feet over the next two miles AND THEN descend a thousand feet over a mile and a half in order to get to an area known as Horseshoe Bend. We made our trek to the top and took a break at Slaty Place. In many ways Slaty Place reminded me quite bit of Clifty Falls State Park in Madison, Indiana with a lot of tree covering and nice big, cool slab rocks to sit on. We took about a fifteen minute break before continuing on to Horseshoe Bend and then the much talked about Hemmed in Hollow. Our steep descent was upon us. 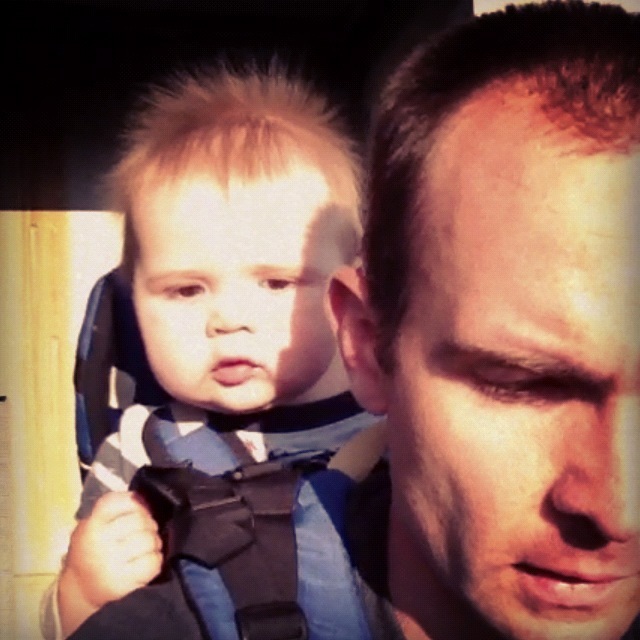 For all of the work that went into pushing against gravity on the way up…we were fighting it on the way down. My pack seemed about 50 pounds heavier than it did at the beginning of the day. The trees and trail gave way to the water once again. 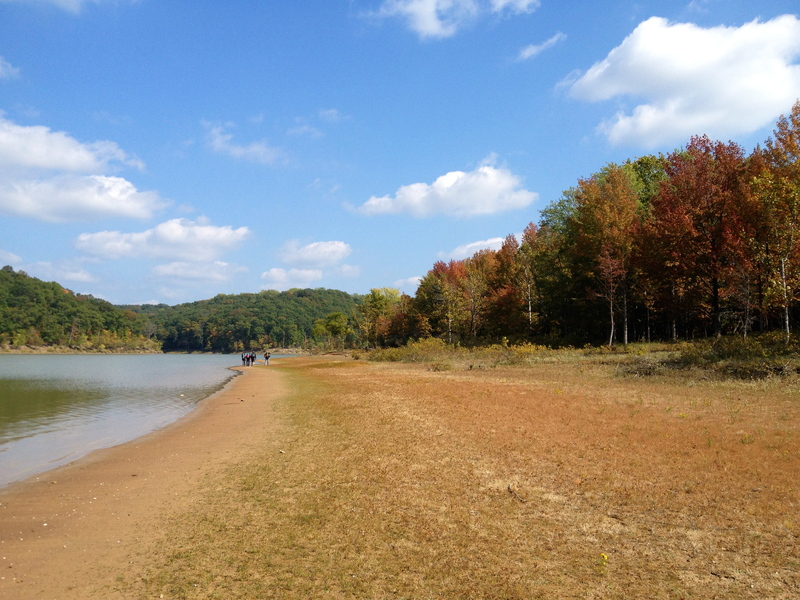 We had arrived at Horseshoe Bend in the Buffalo River. It was time to jump in and cool down. 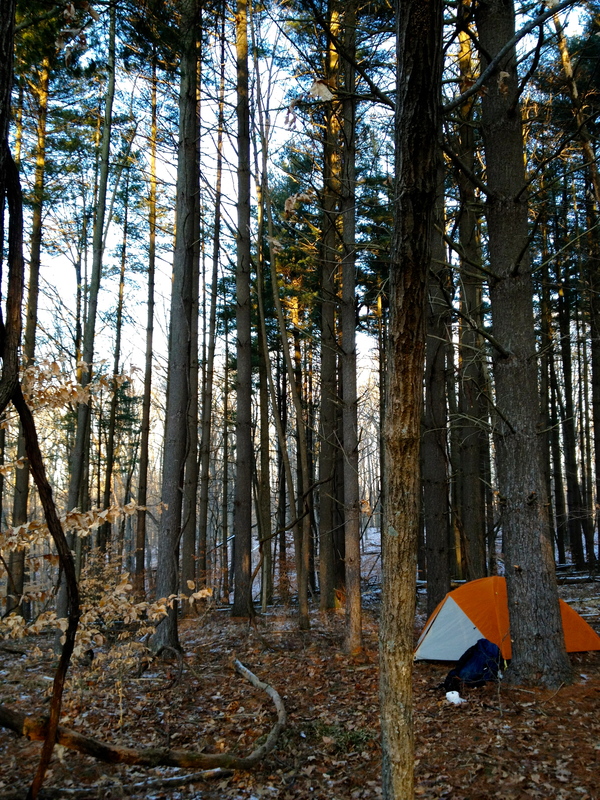 We decided to set up camp in the woods on top of a smaller bluff and then hike back to Hemmed in Hollow. Even though we had hiked a little over nine miles up to this point, the last mile to Hemmed In was considerably easier without our packs and gear. As we came around the last bend on the trail we witnessed the largest waterfall between the Rockies and Appalachians….towering at about 230 feet. We couldn’t imagine doing anything else but running up to it and standing under it. This hollow was utterly amazing. I just wanted to stay there for the rest of the evening. After a hot, stuffy, laborious hike the cool mist and swirling winds were a welcome relief. Hemmed in Hollow was the exclamation point at the end day one…and it was well worth the workout to get to it. Fortunately it was not even close to being the exclamation point for our entire trip. That evening we walked over to the top of the bluff where we were camping and began to do some bluff jumping into the river. 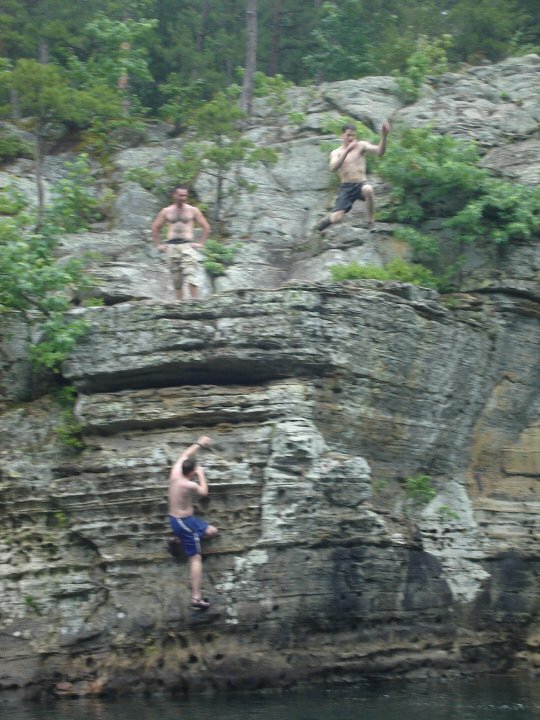 The next few days were full of canoeing, more bluff jumping, swinging from ropes over the river, and swimming.